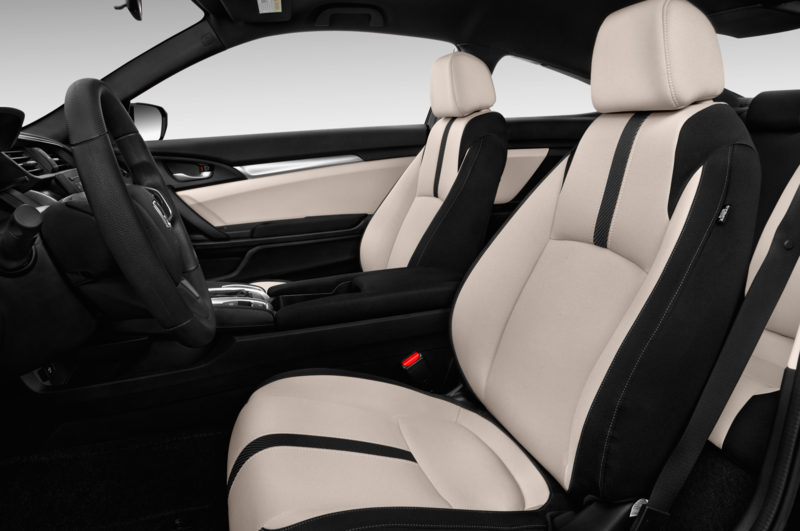 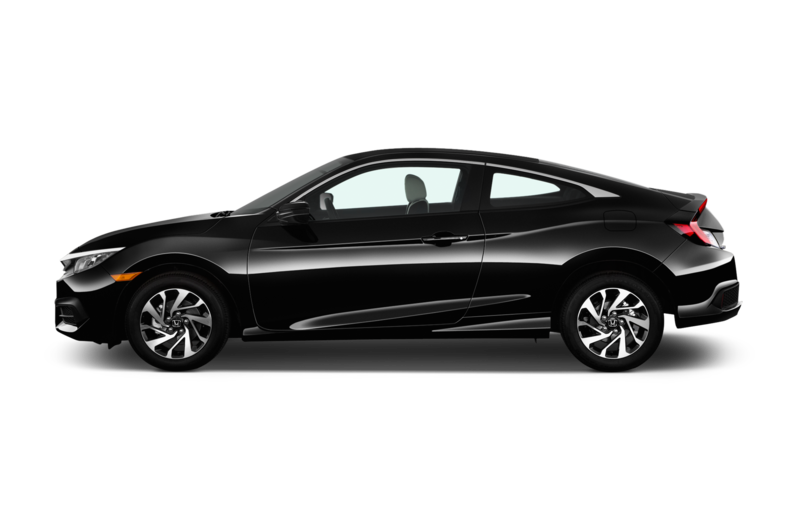 Opting to buy a two-door coupe rather than a four-door sedan might be a conscious tradeoff of practicality in favor of style. 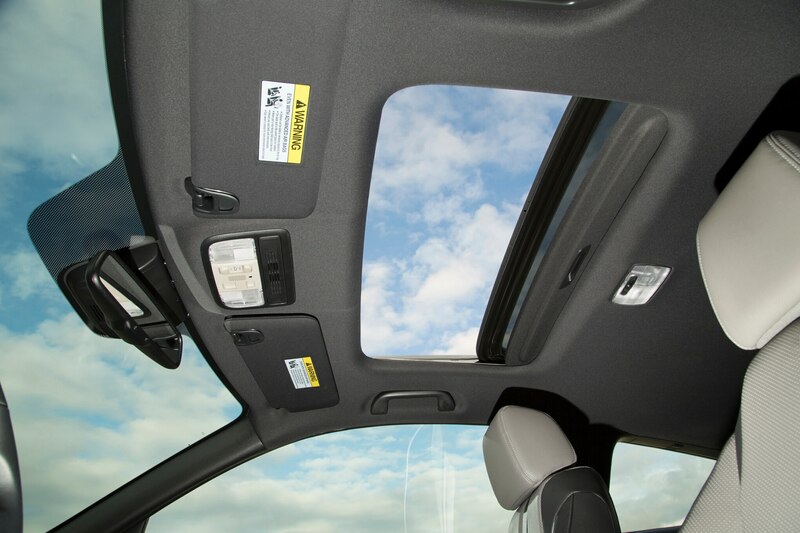 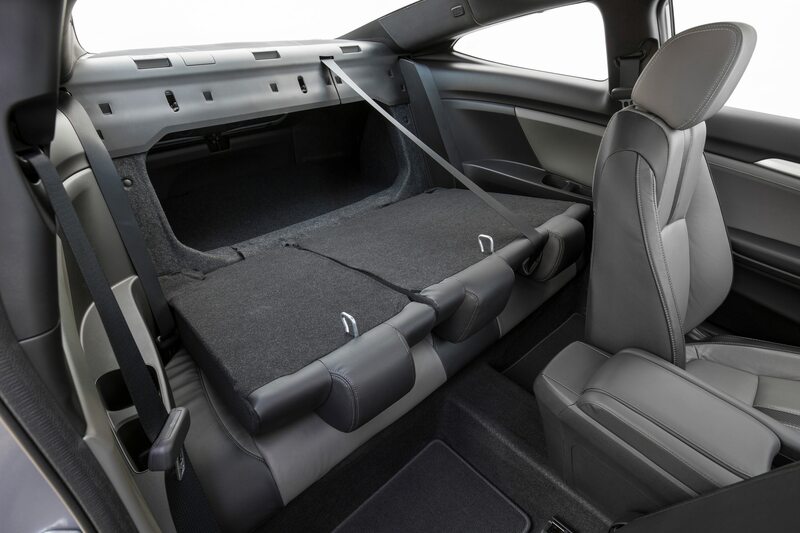 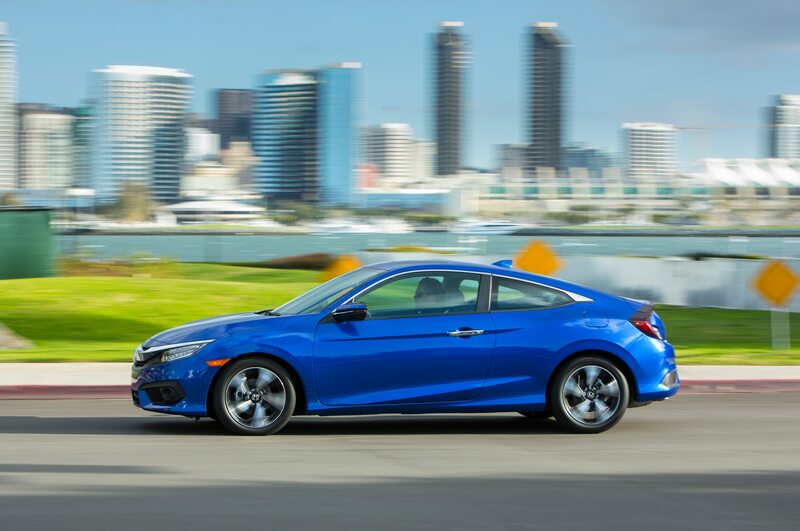 Success in the coupe world, especially in the compact segment, tends to be fleeting, as fashionable styles tend to get stale faster than preservative-free bread. 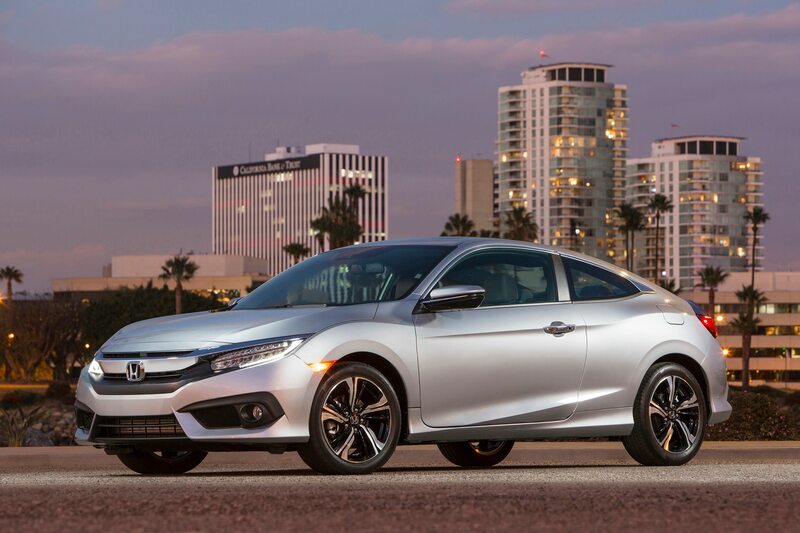 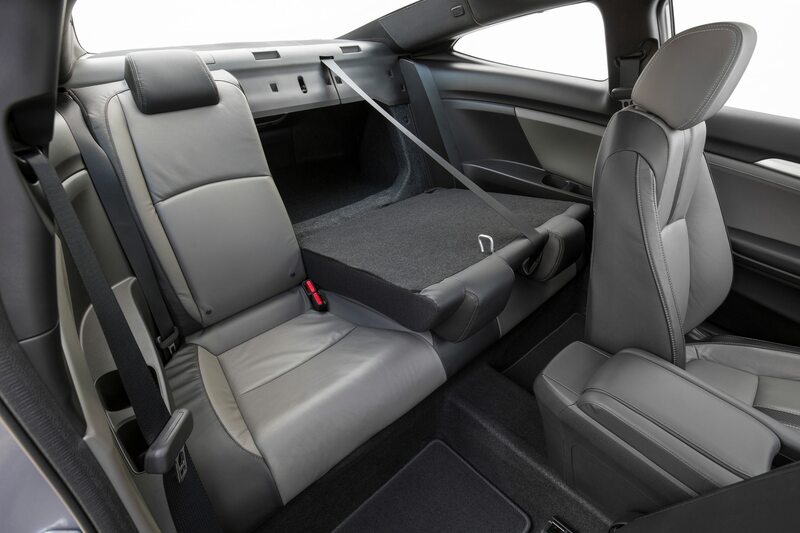 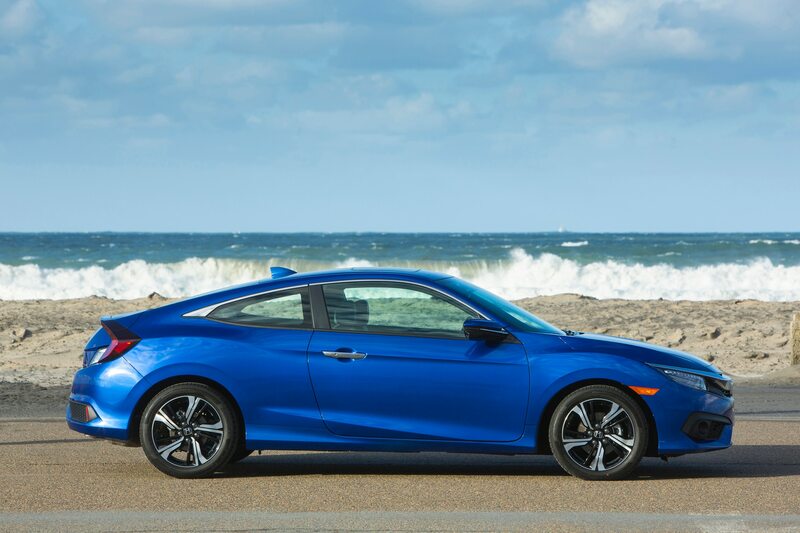 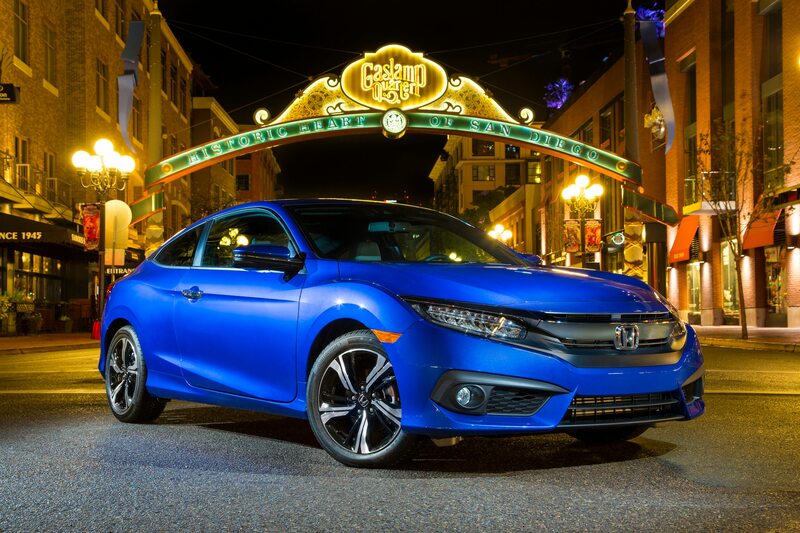 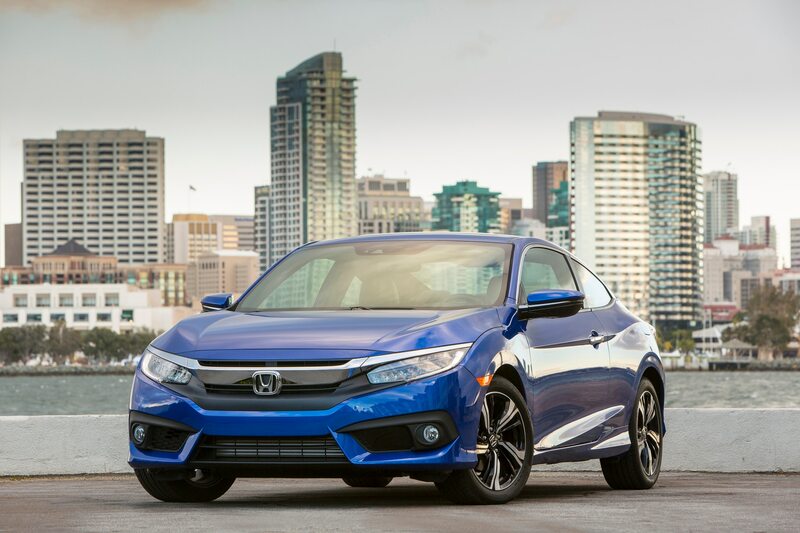 Honda is one of the few mass-market automakers up to this challenge consistently, and the 2016 Civic Coupe Touring does not disappoint. 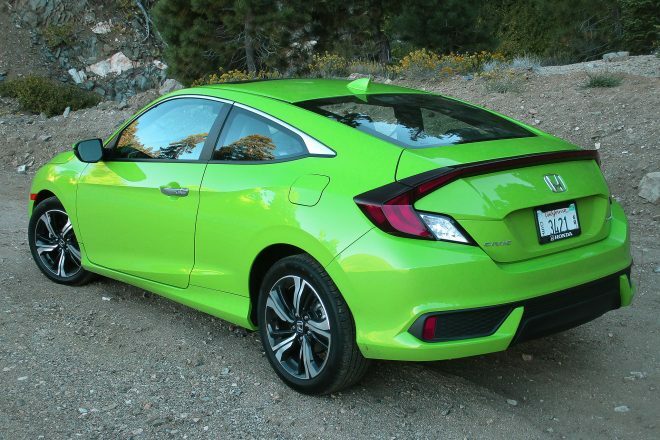 This particular car’s bright Energy Green paint caught our eye immediately; it would look good on a Lamborghini and drew plenty of eyeballs. 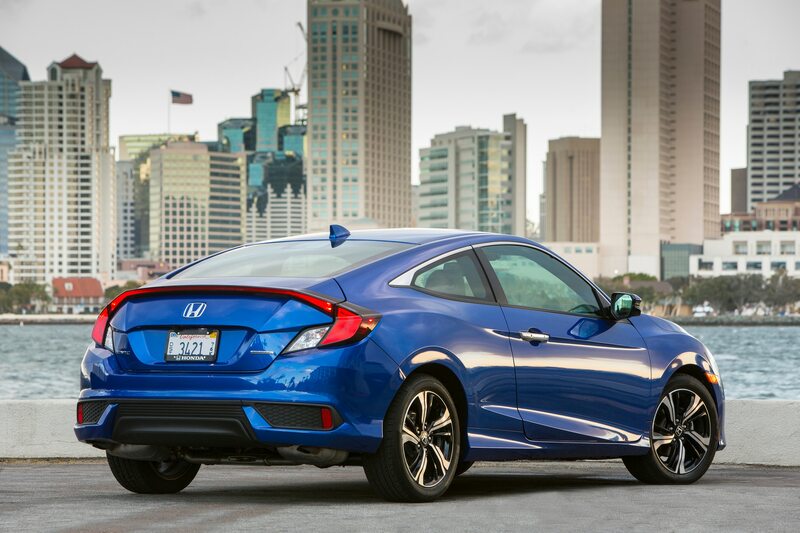 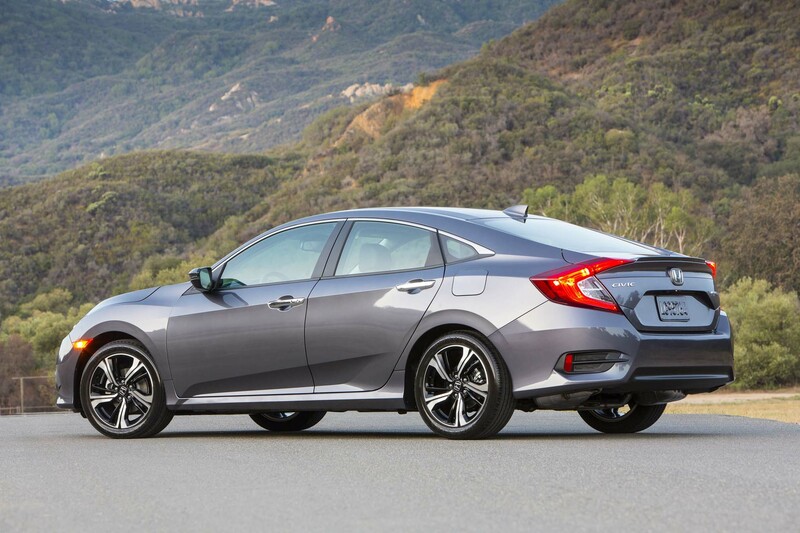 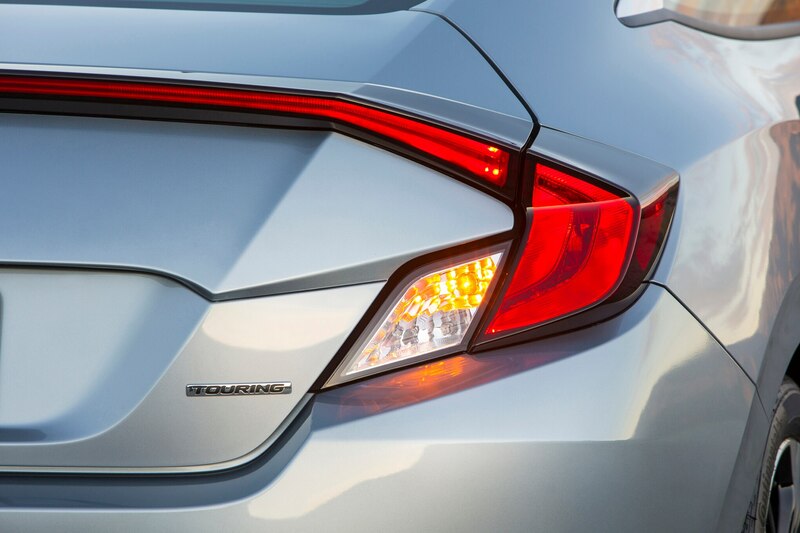 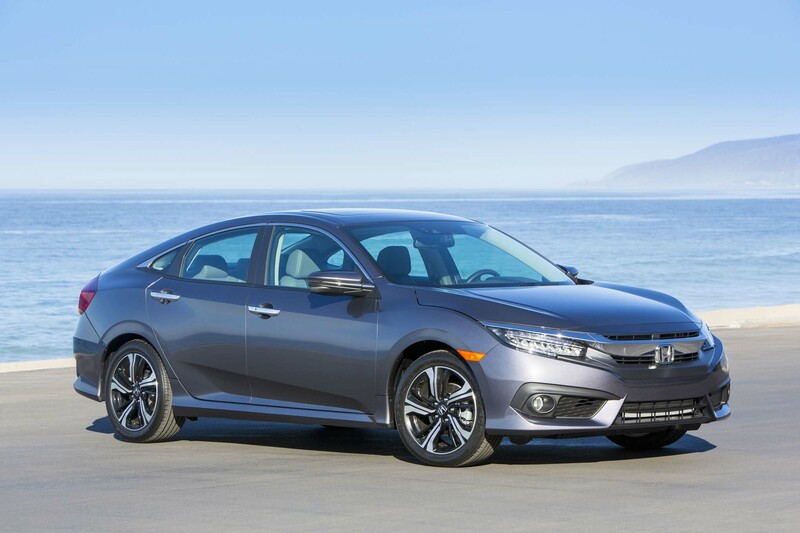 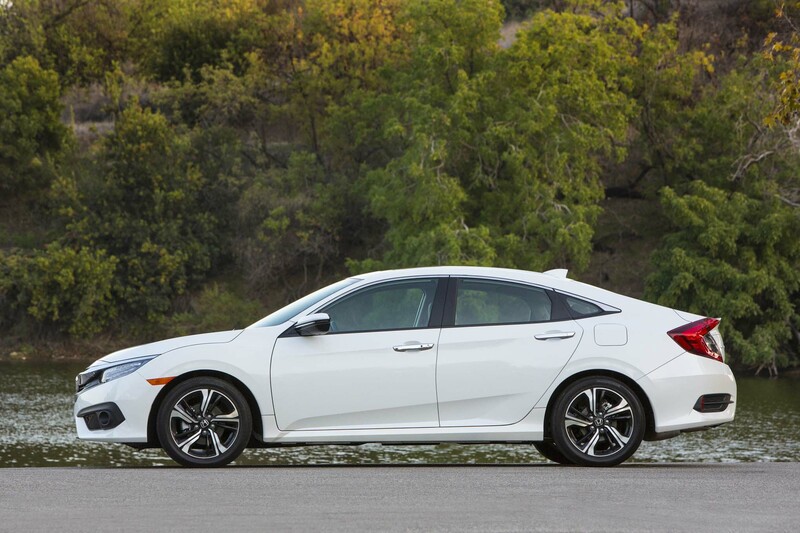 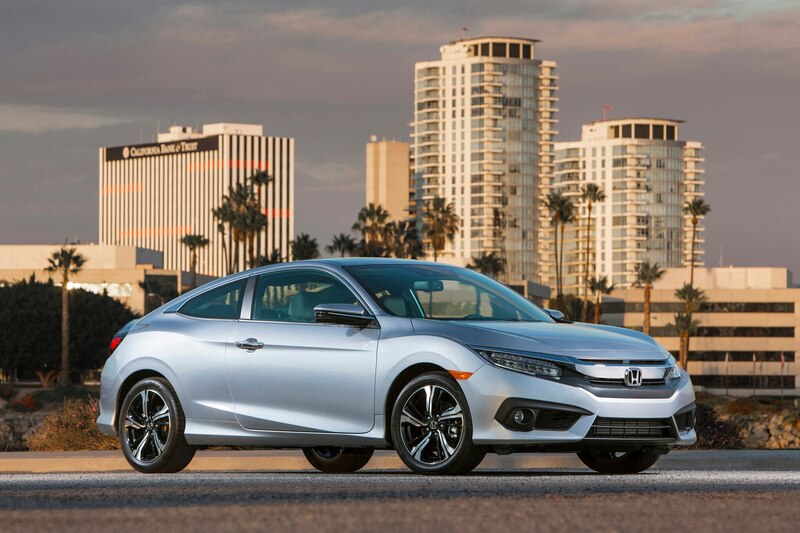 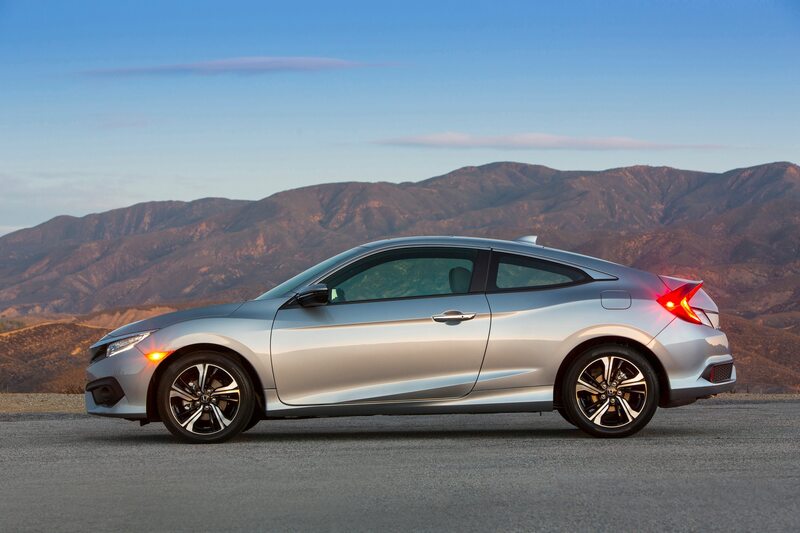 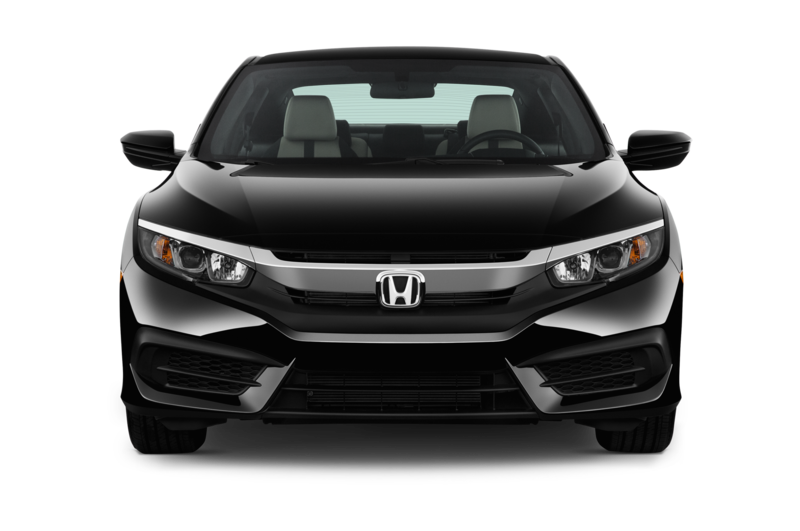 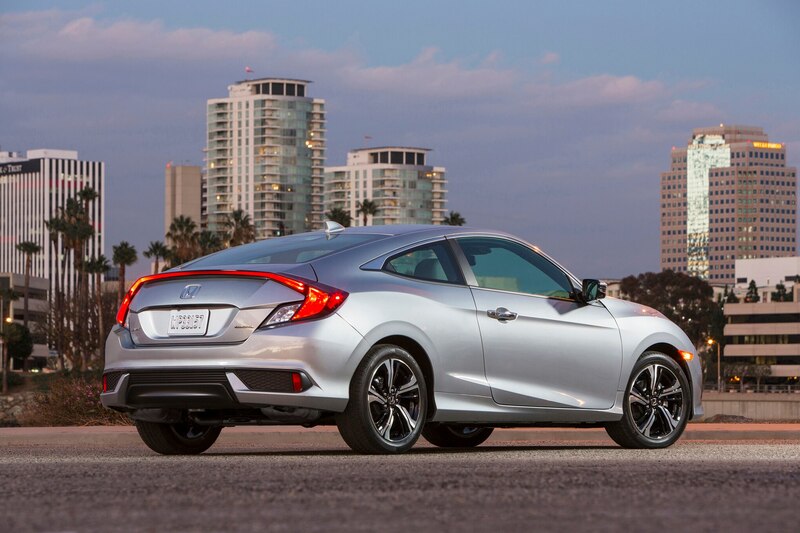 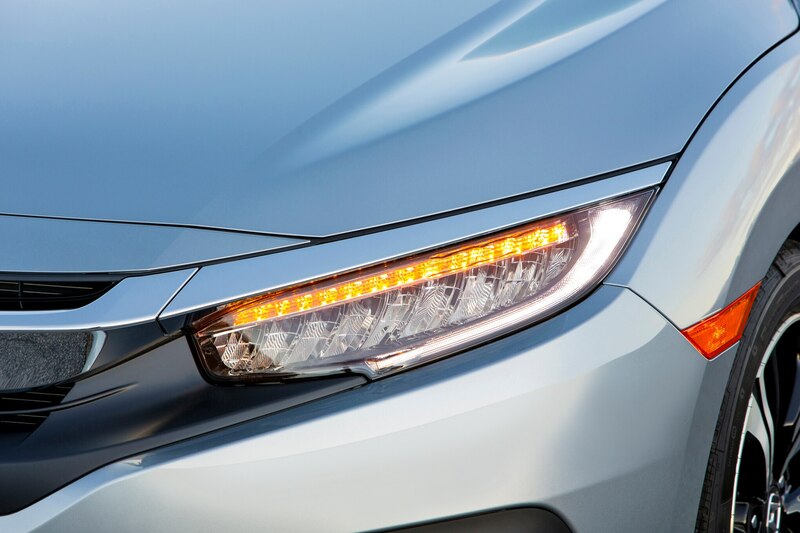 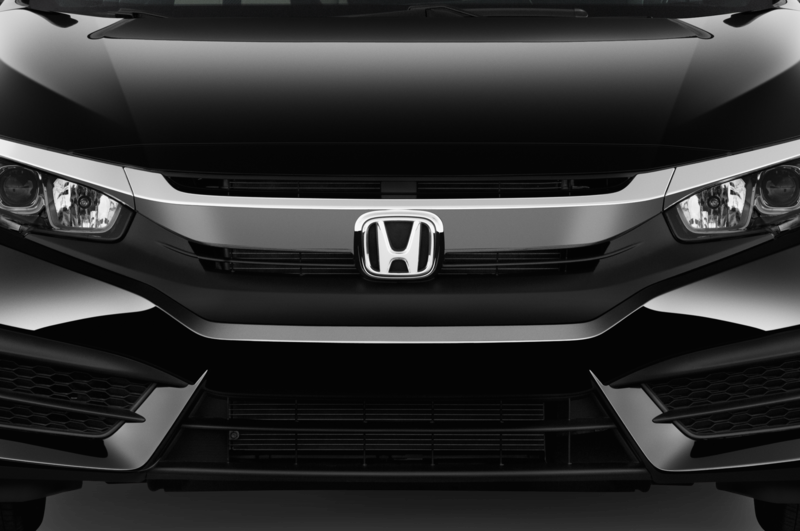 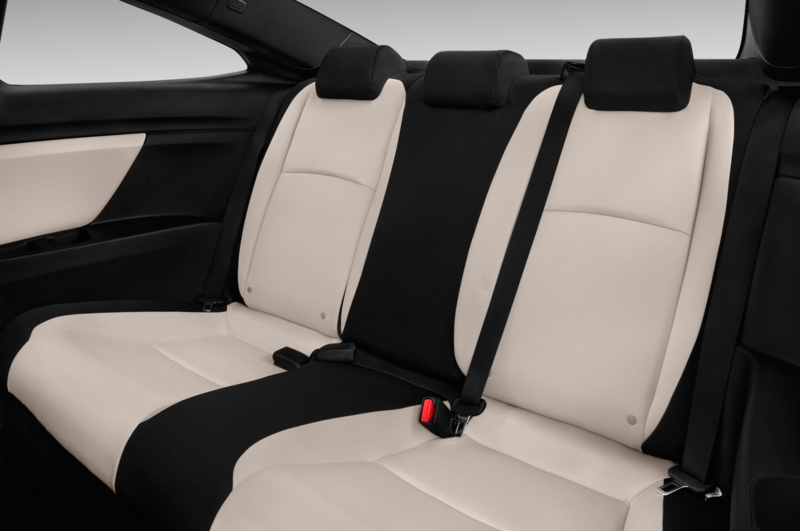 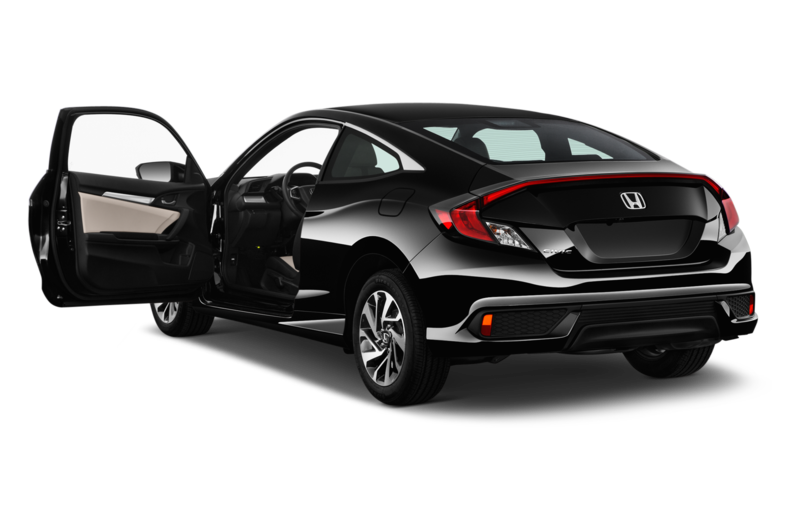 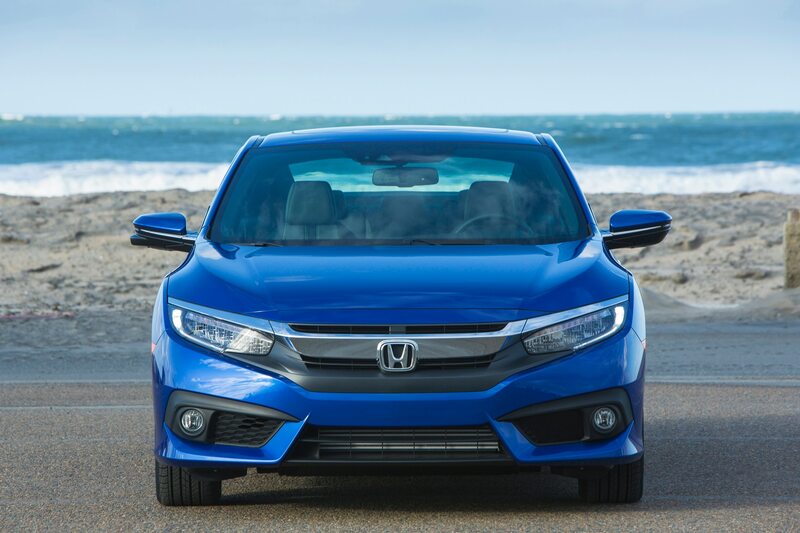 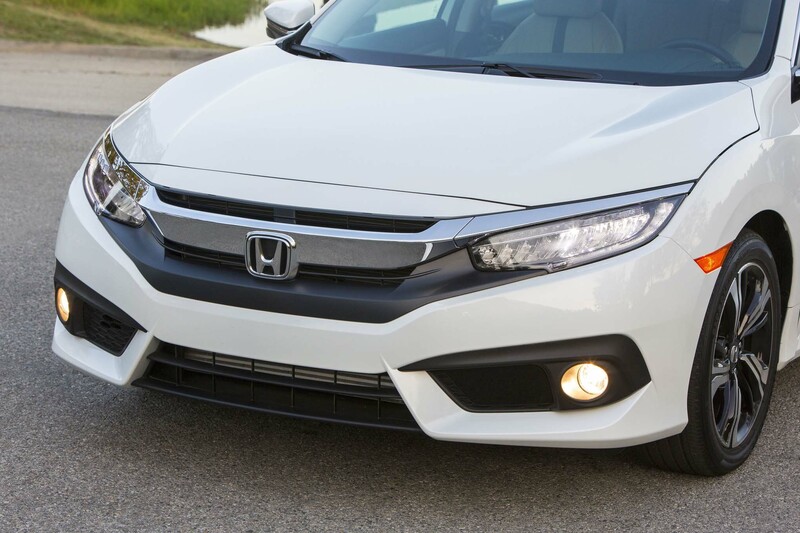 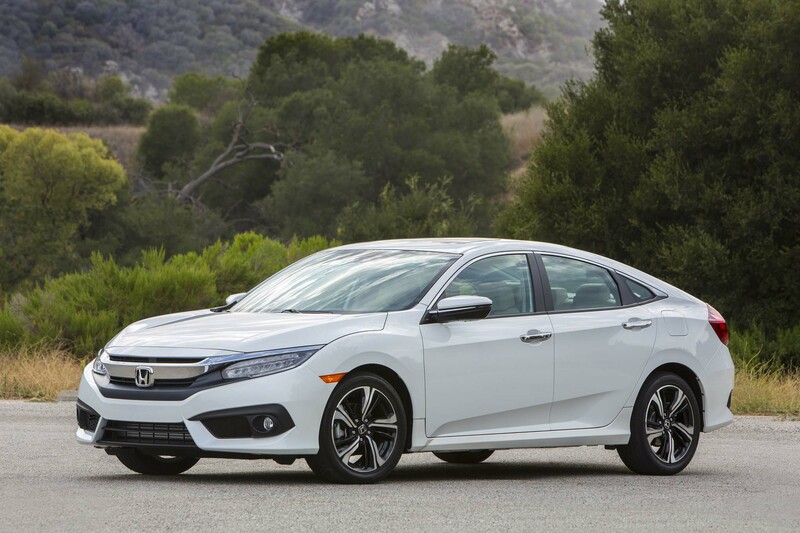 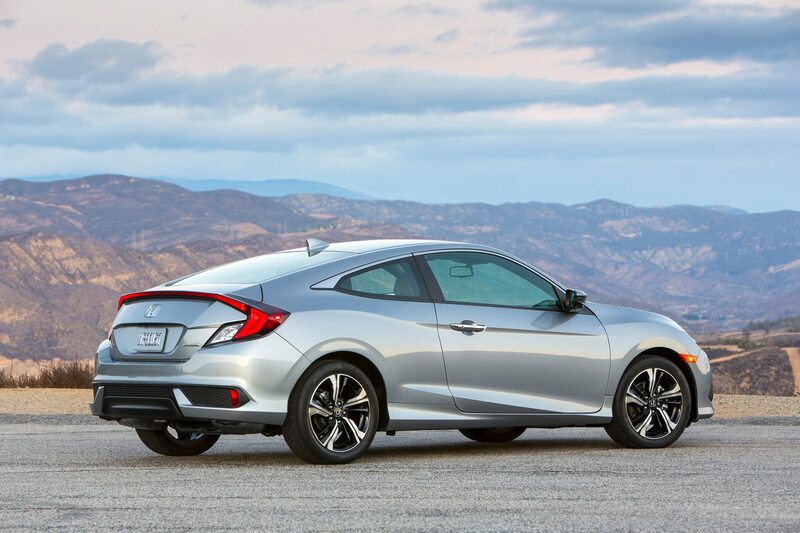 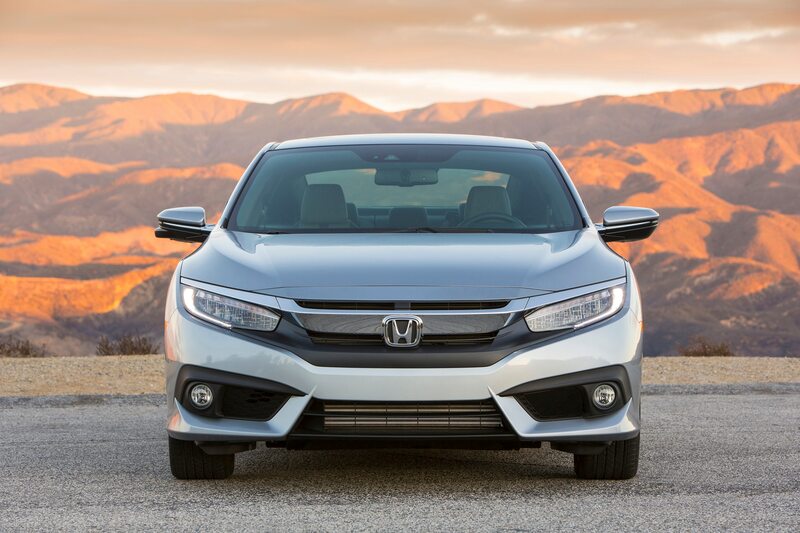 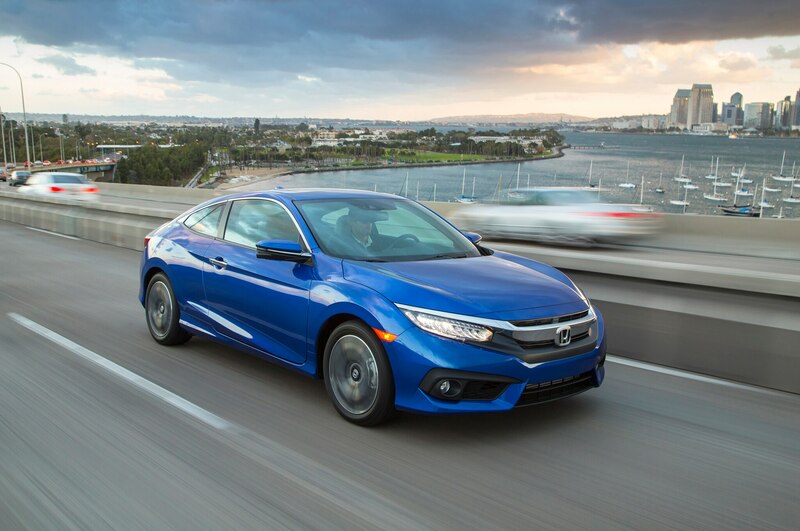 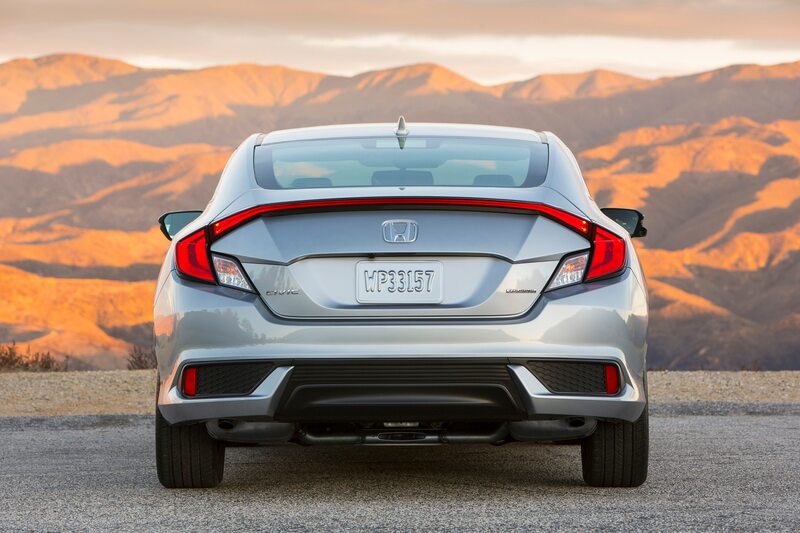 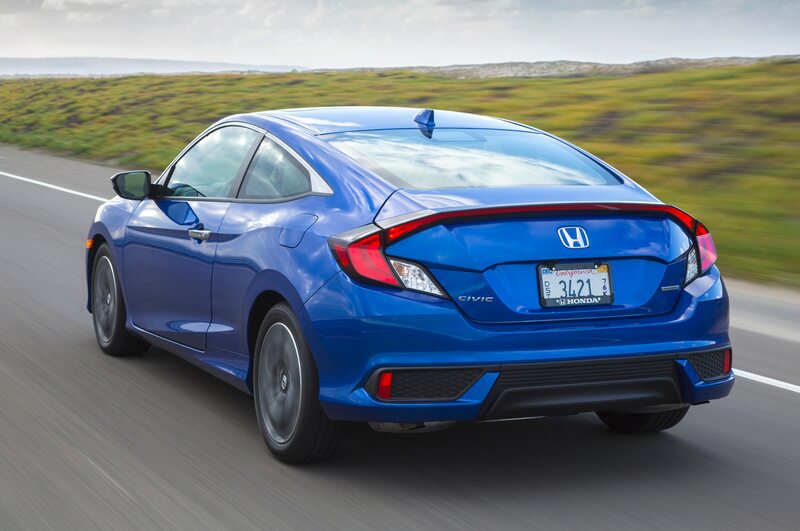 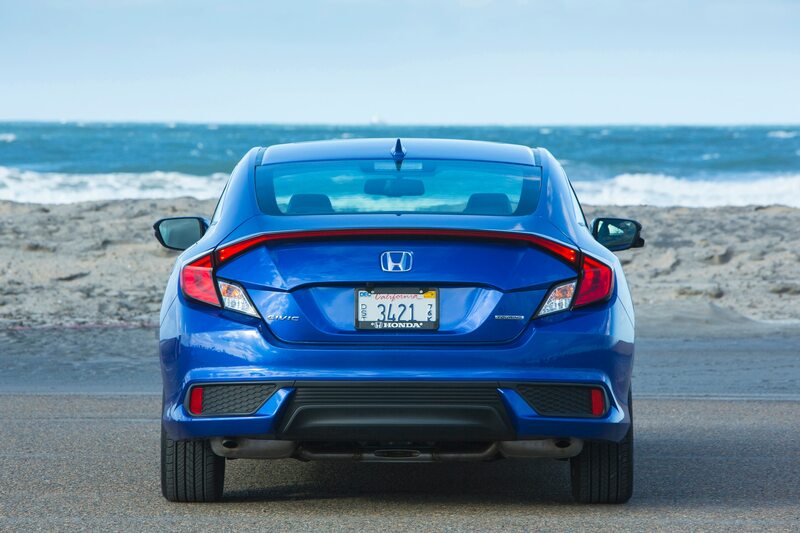 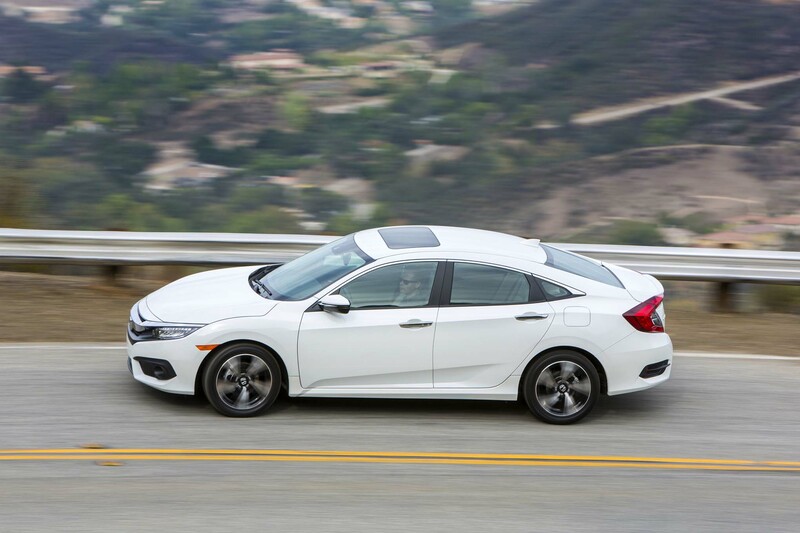 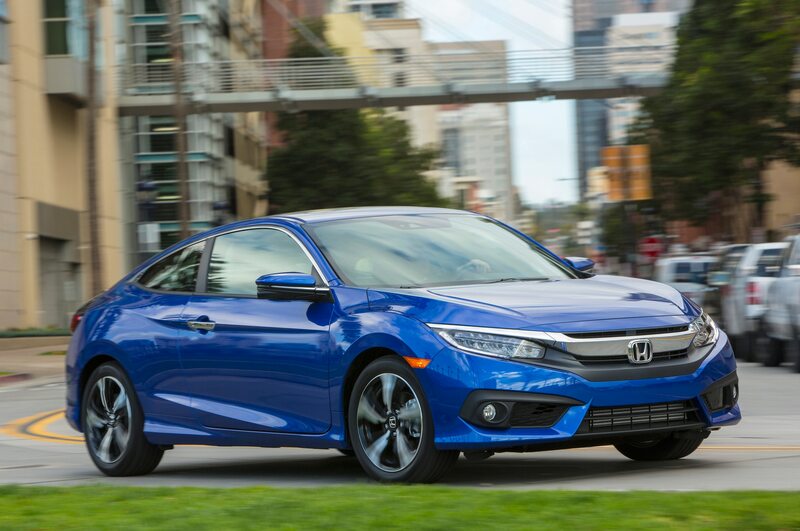 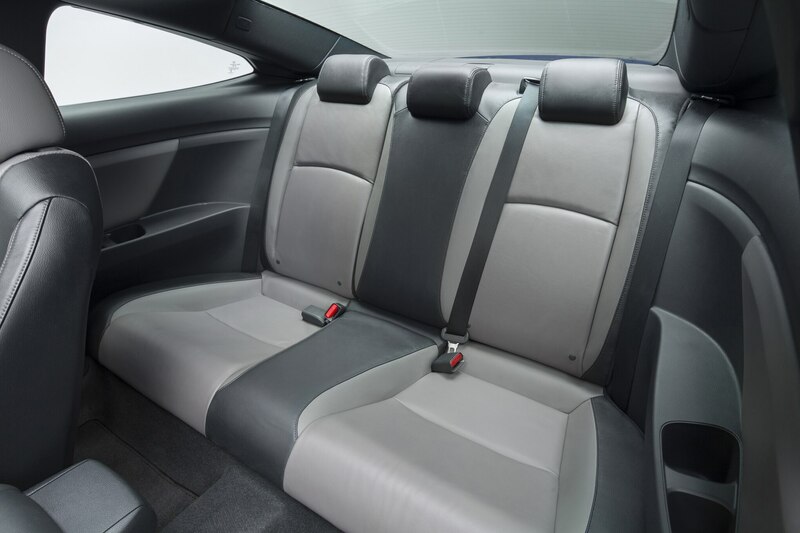 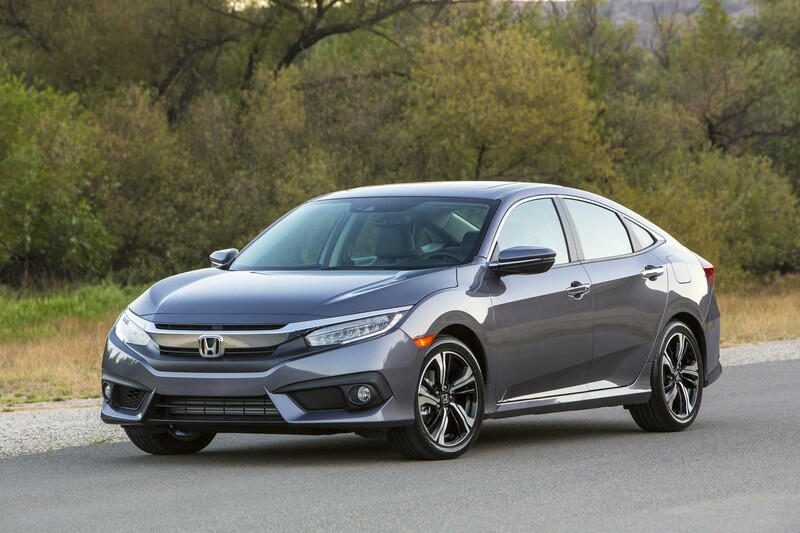 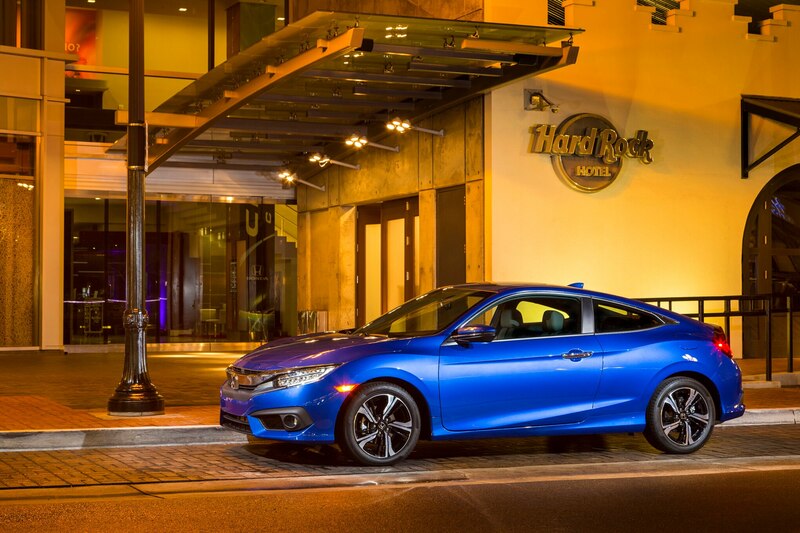 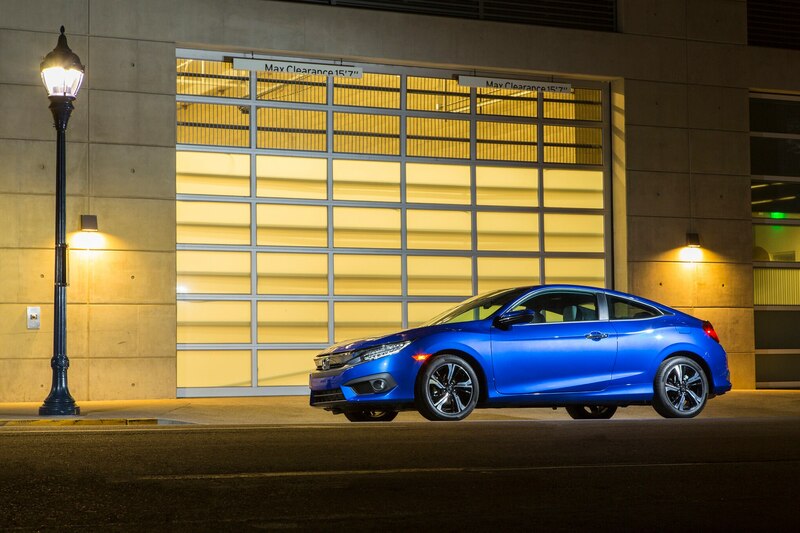 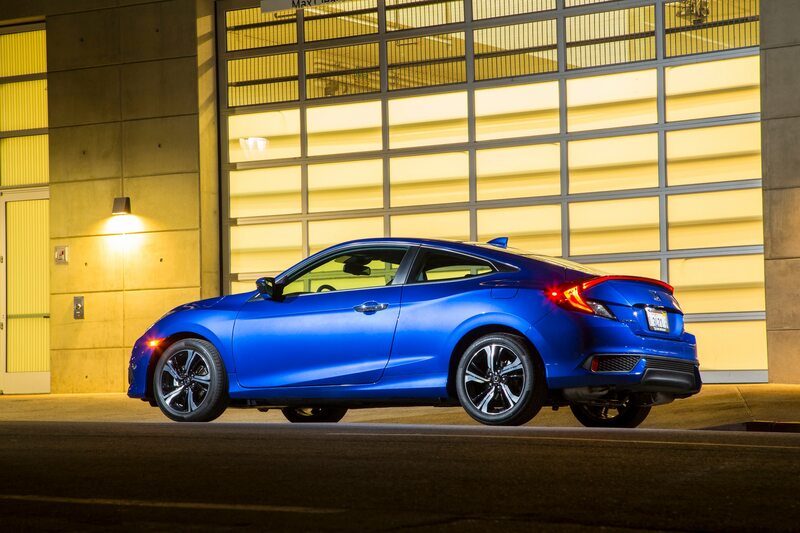 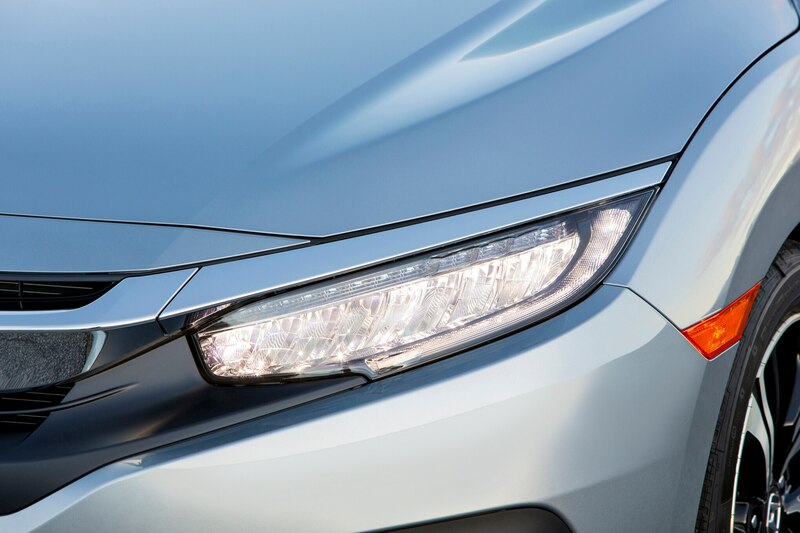 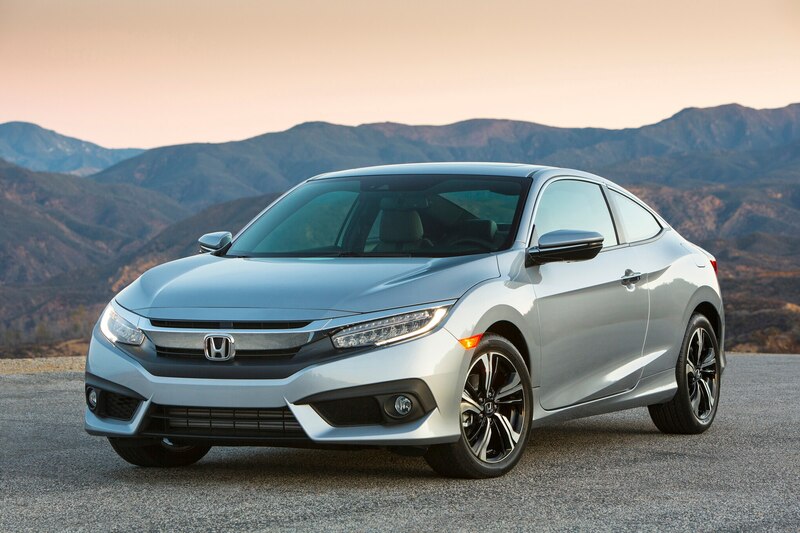 It complements the Civic’s aggressive styling, which of its three available body types the coupe wears best. 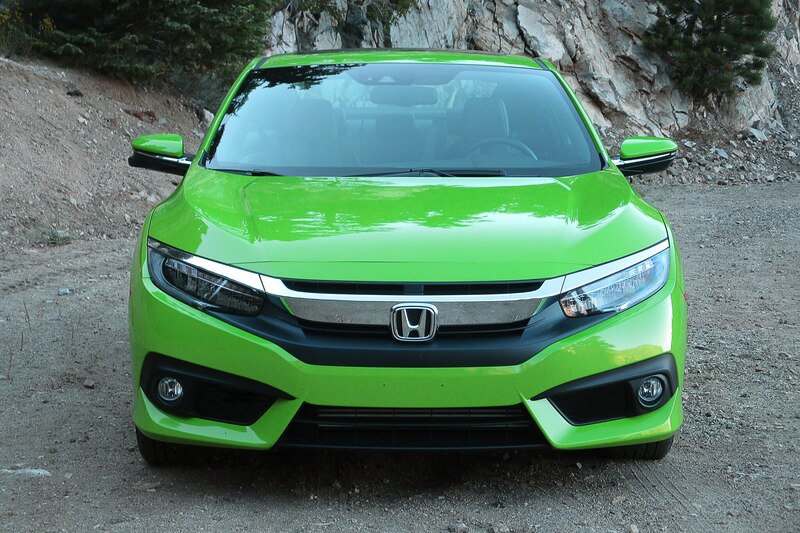 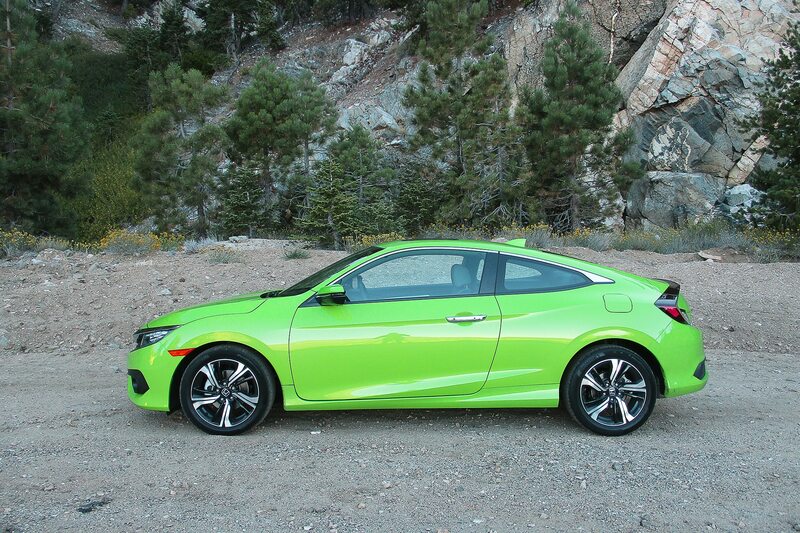 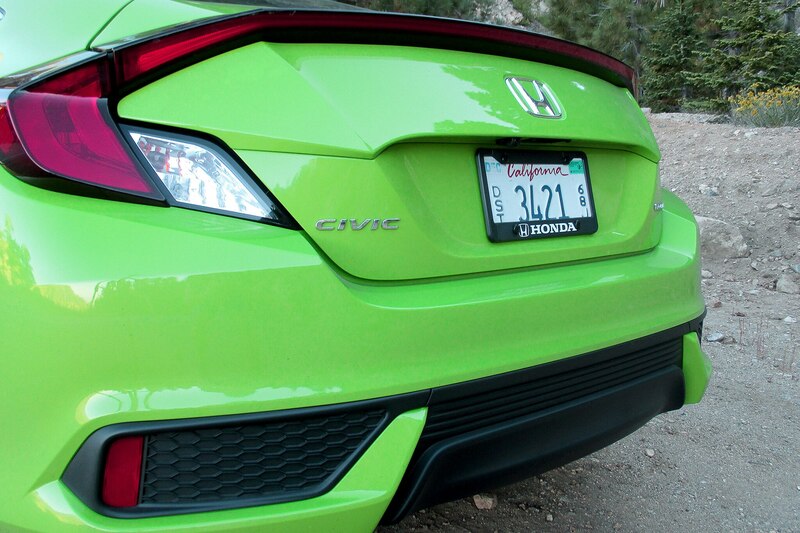 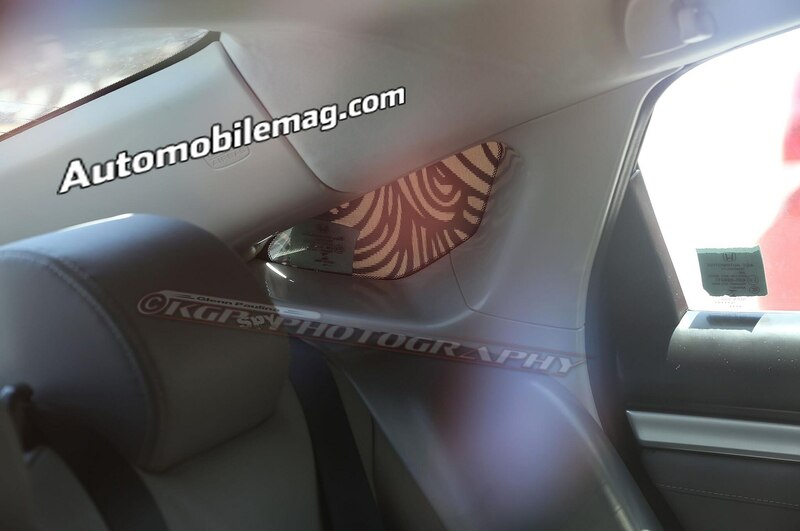 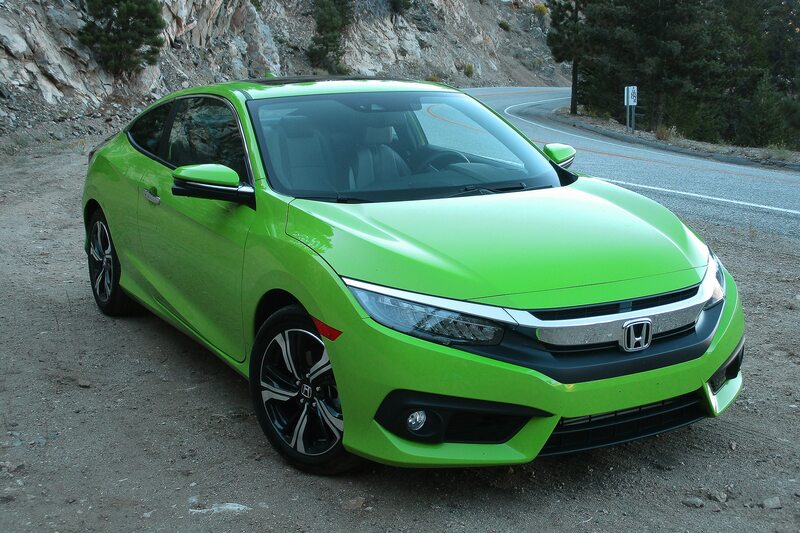 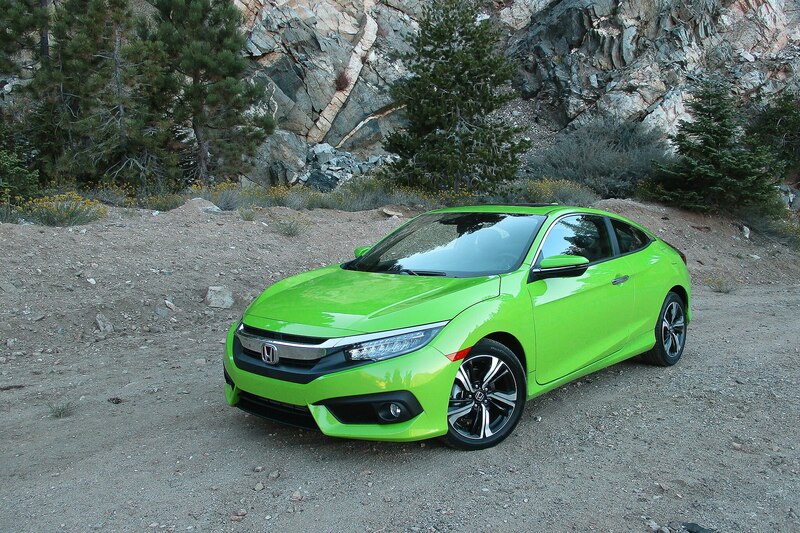 Honda rightly offers the green skin only on the coupe, as it would look silly on the Civic sedan and hatchback. 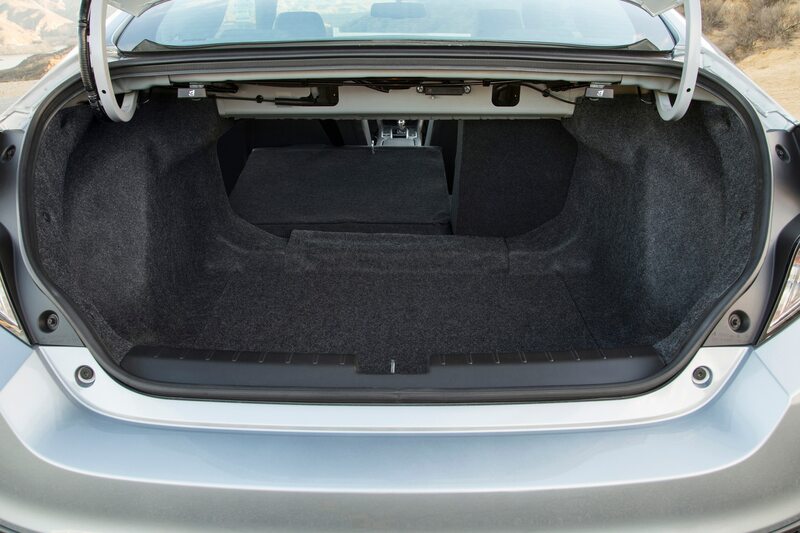 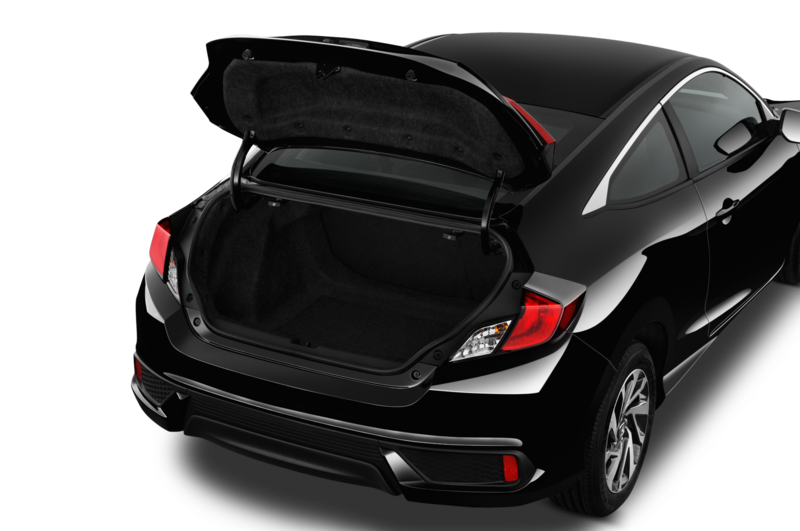 We wish the coupe had a liftback rear, however; it would greatly improve the coupe’s practicality. 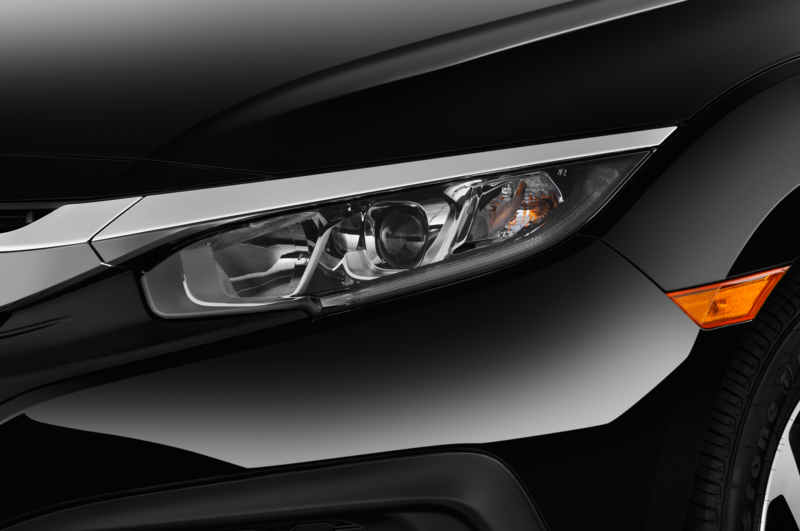 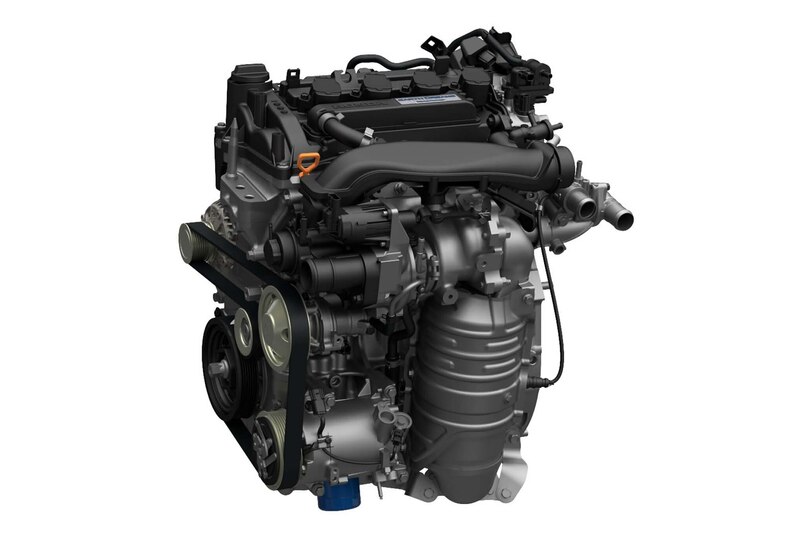 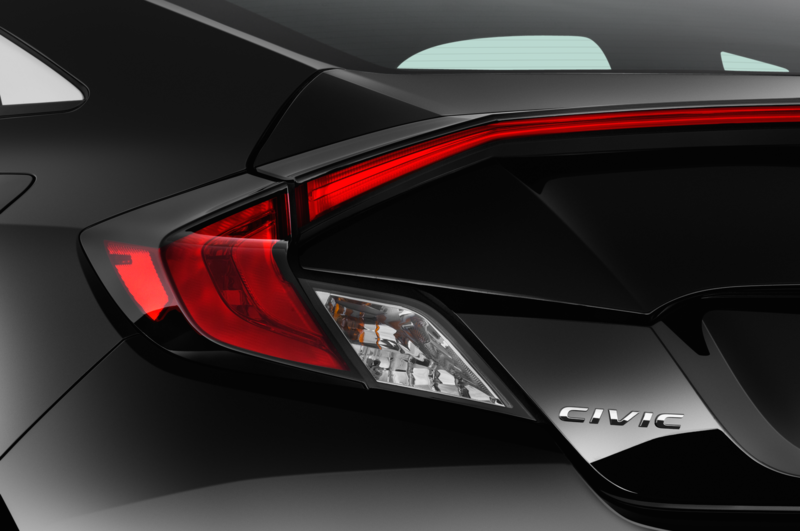 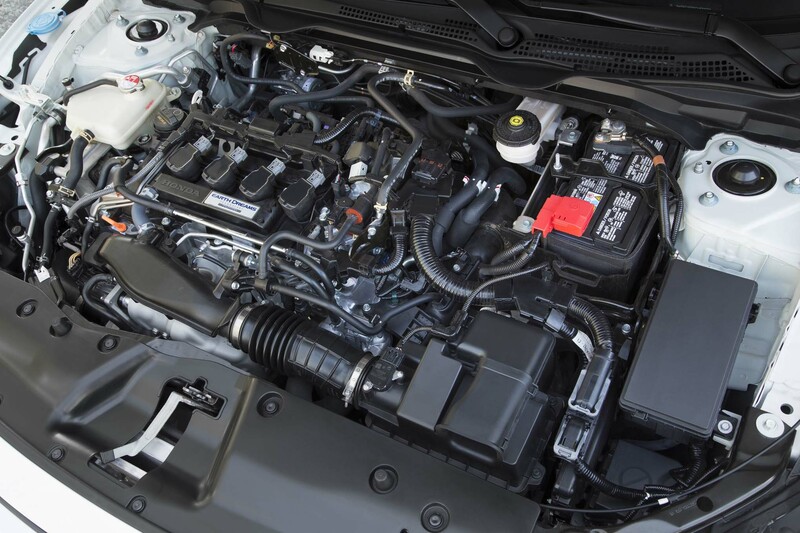 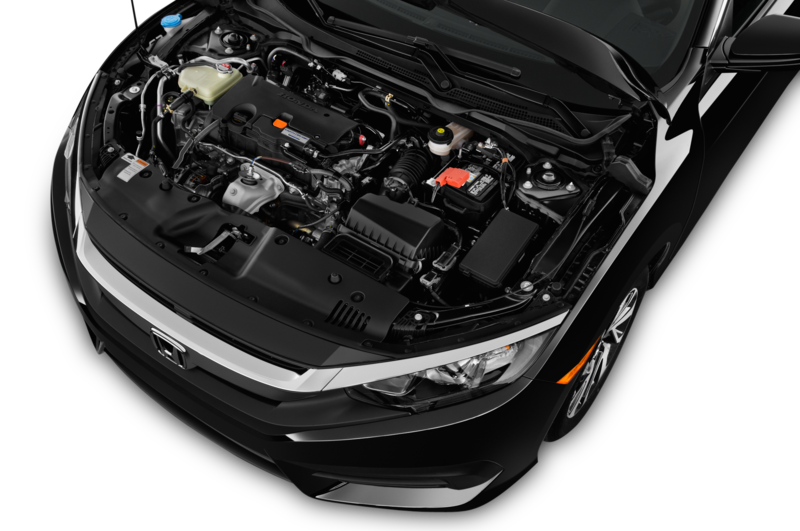 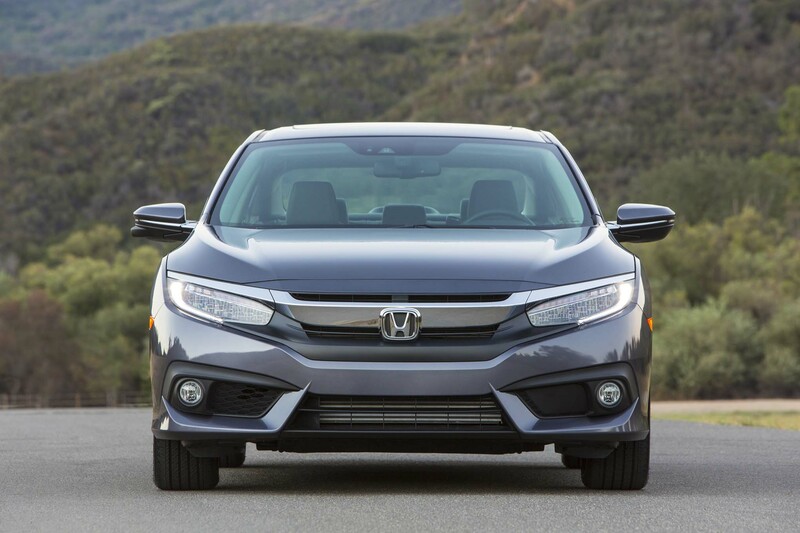 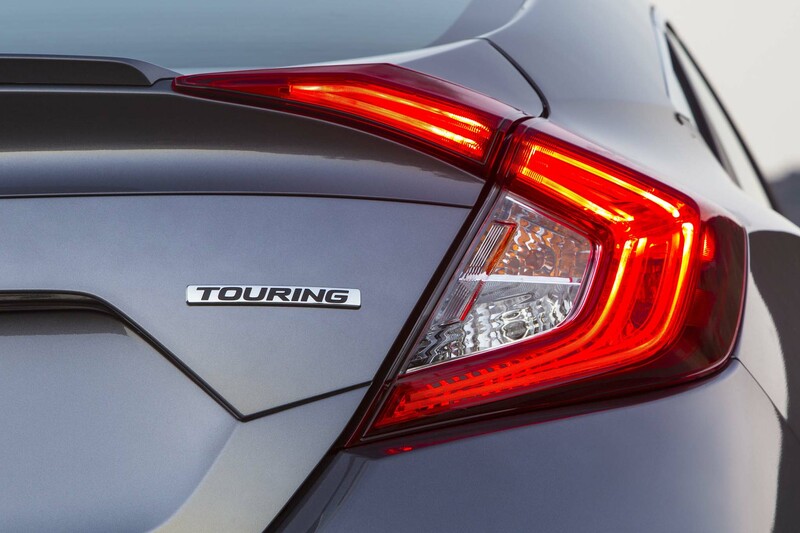 A 1.5-liter turbo-four mated to a continuously variable transmission powers the Civic Touring. 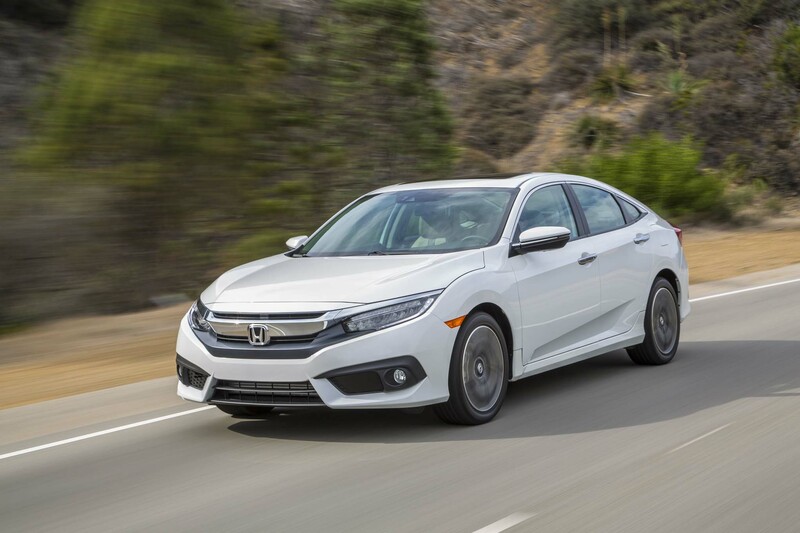 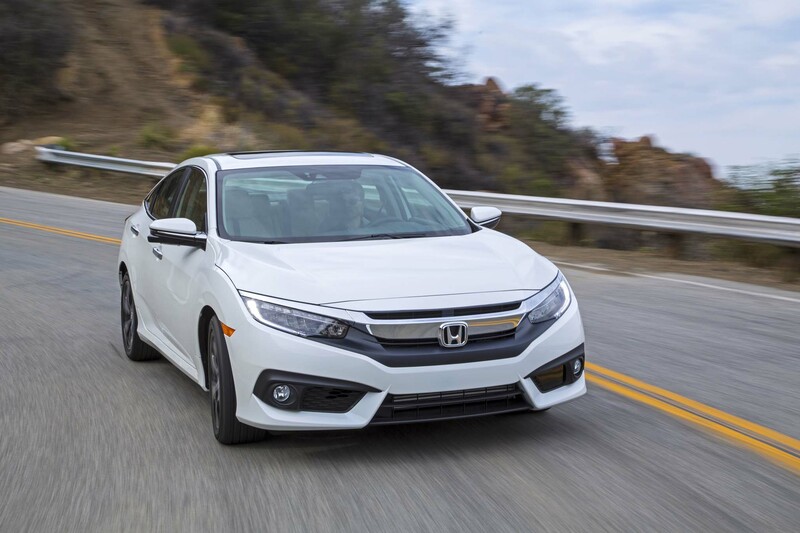 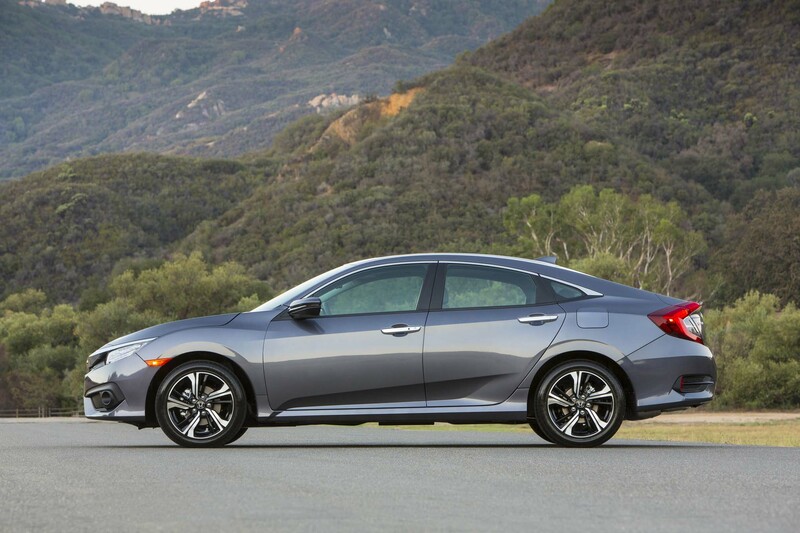 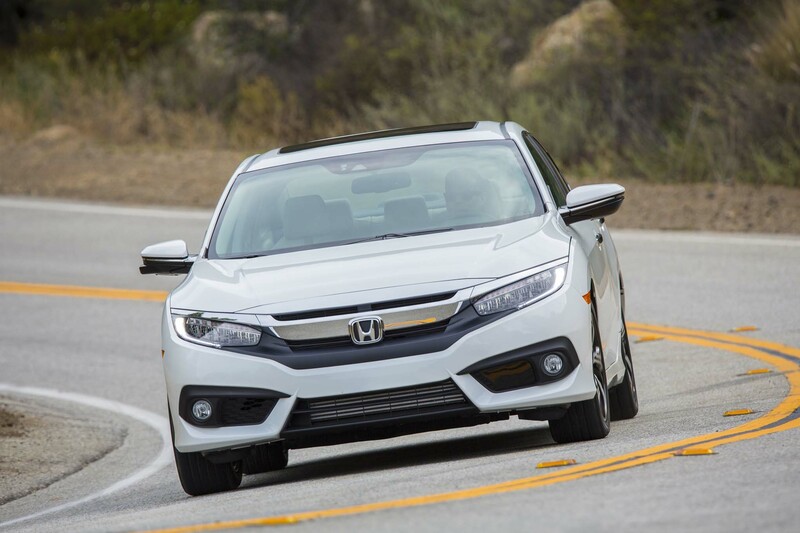 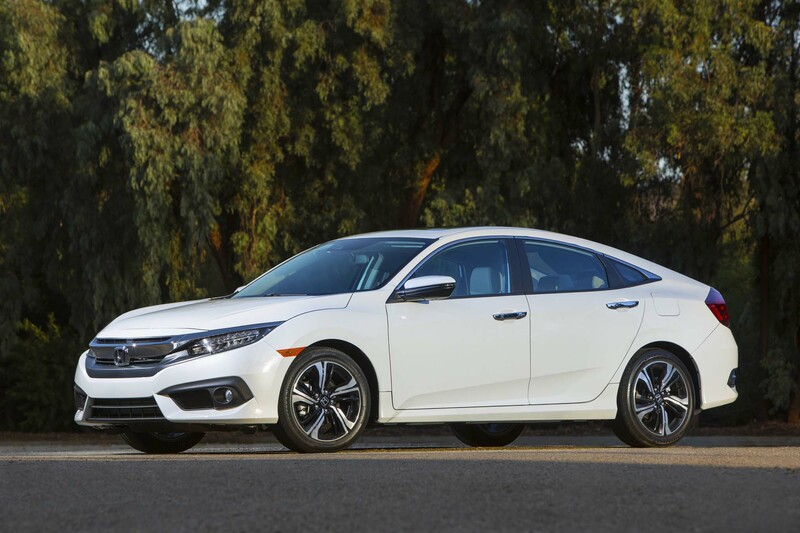 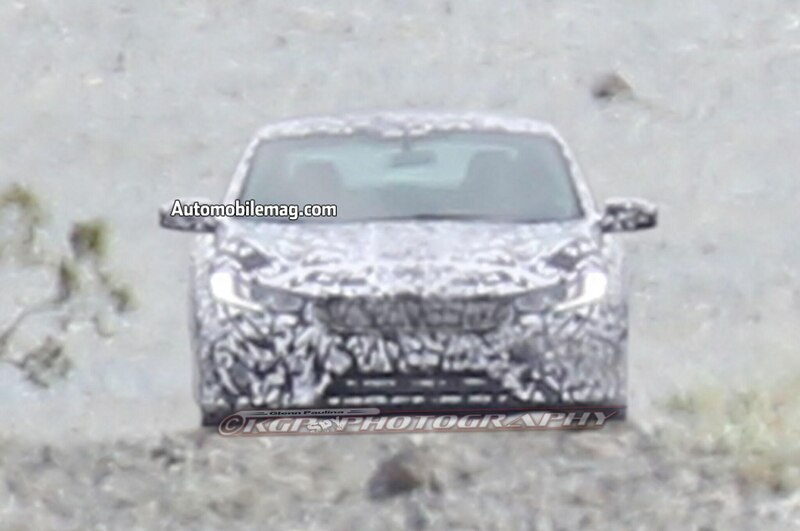 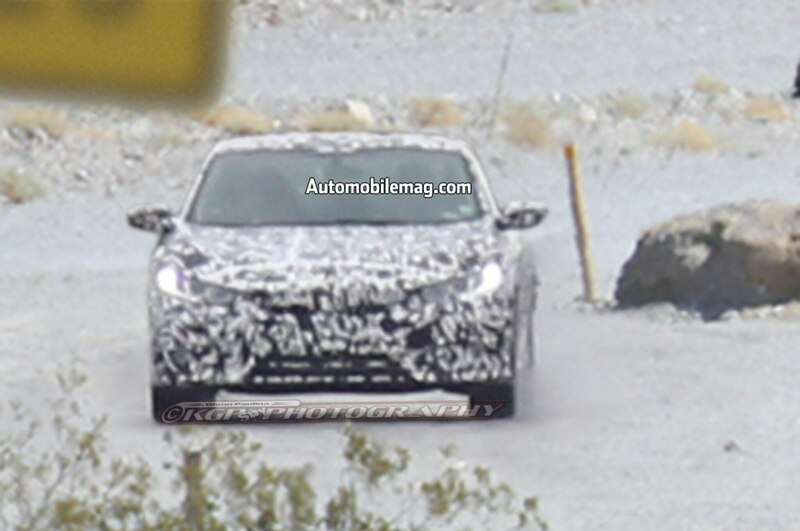 The engine is good for 174 horsepower (14 horses more than the famous sixth-generation Civic Si of the late 1990s) and 162 lb-ft of torque, with the latter coming in at just 1,700 RPM; in a recent Motor Trend test, it was good enough to propel a Civic Touring sedan from 0-60 mph in 7.2 seconds. 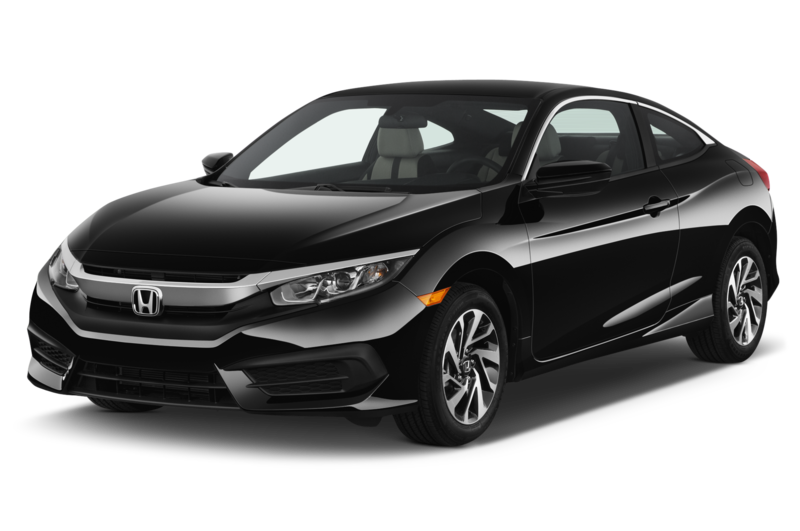 Not lightning quick, but not bad for a mass-market compact. 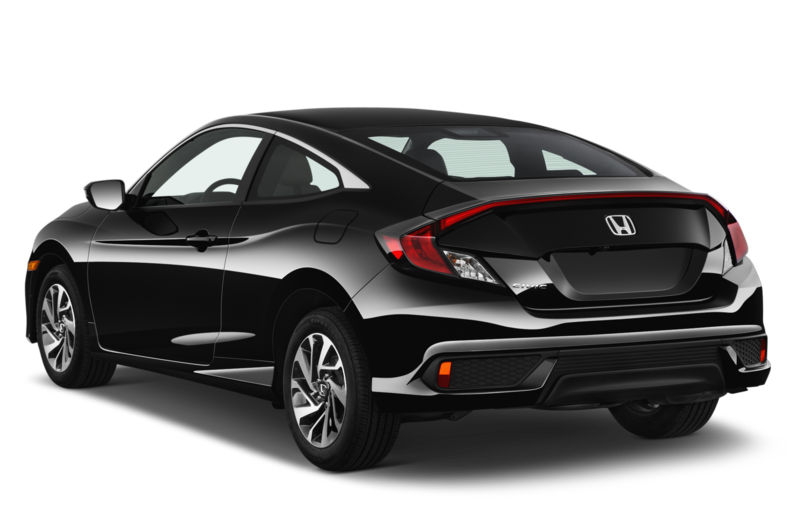 The package is comprised of six systems: adaptive cruise control, lane keep assist, forward collision warning, lane departure warning, road departure mitigation, and collision mitigation braking. 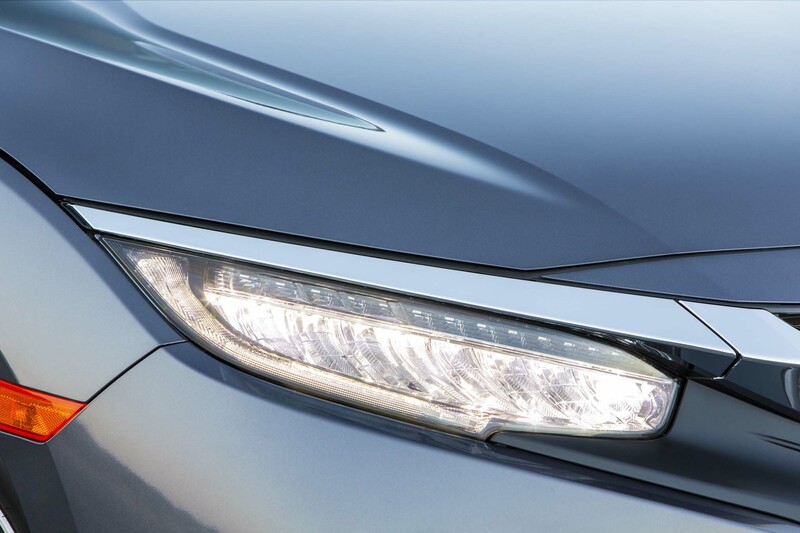 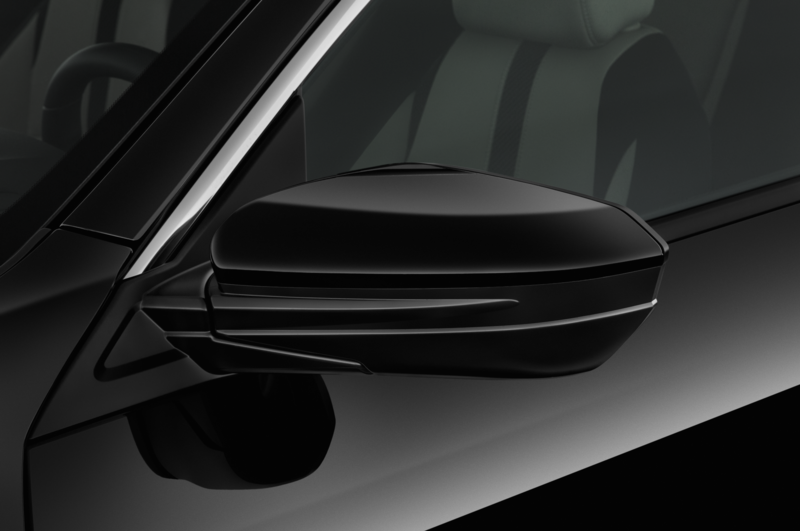 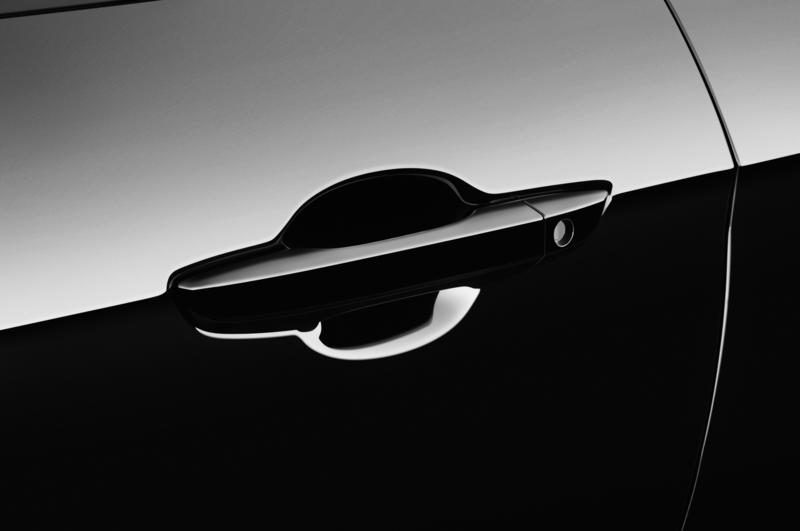 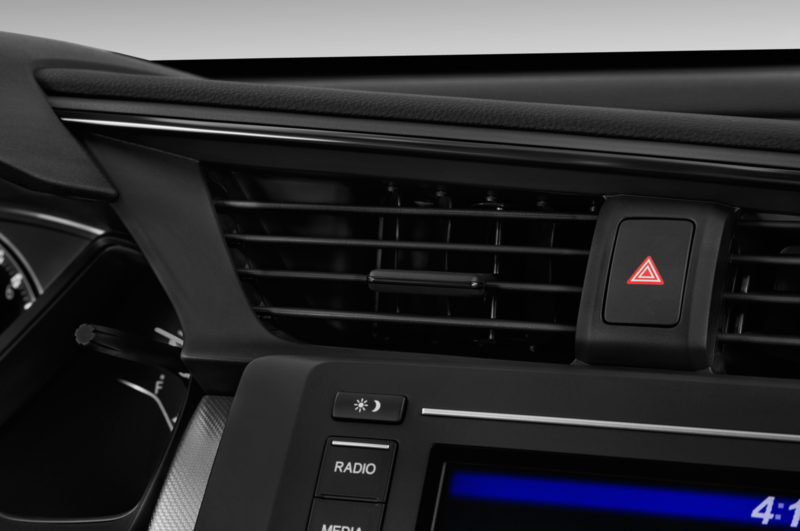 The lane-keep assist system will hold the lane even through a slight curve, provided the lane markers are clear. 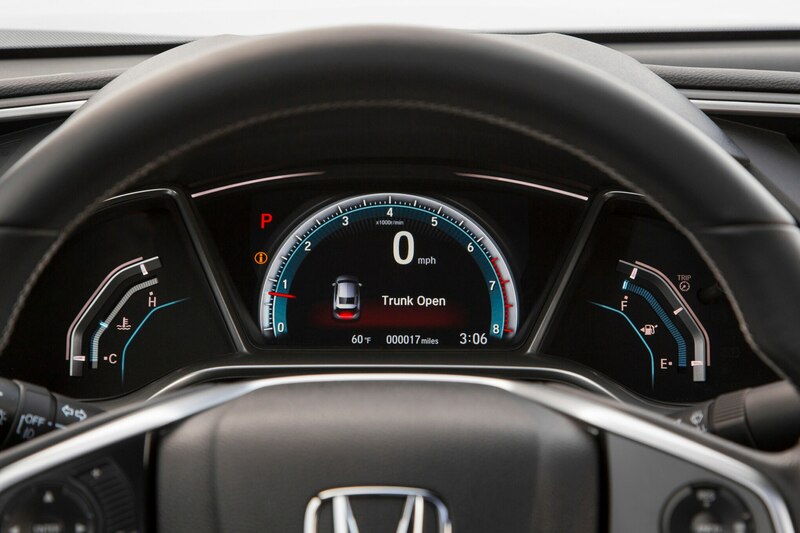 But the adaptive cruise control is the standout. 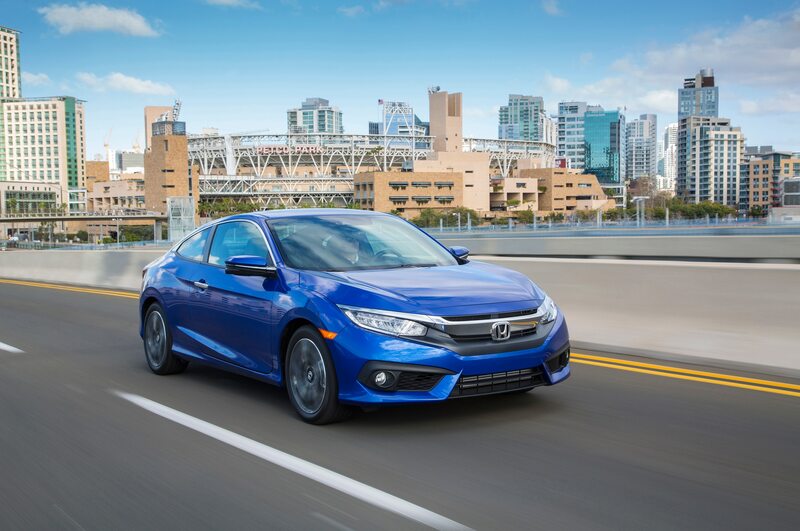 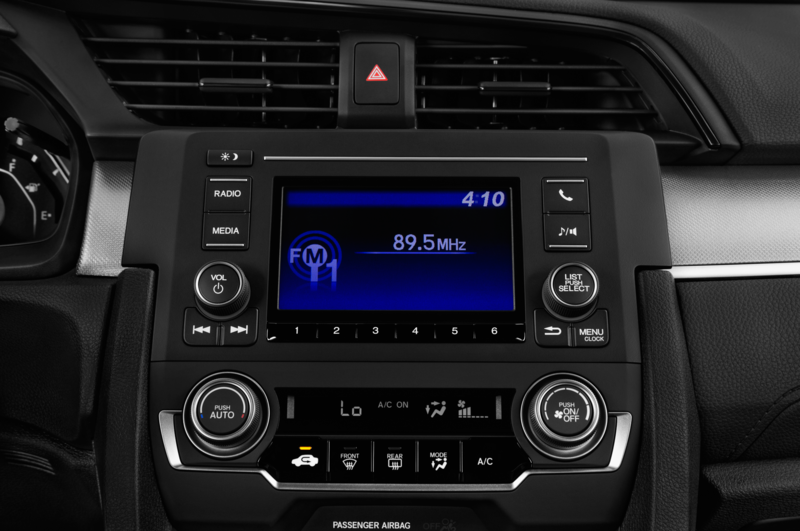 Thanks in part to the other active technologies, Honda’s active cruise control is one of the best such systems; not only does it do an effective job maintaining a safe speed and distance, it will safely bring your car to a complete stop in traffic and will remain active afterward. 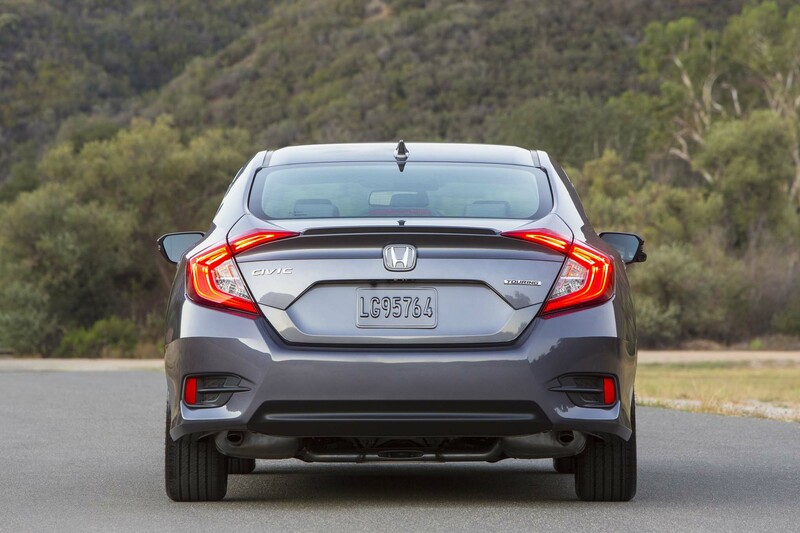 Just tap the gas as soon as the car in front begins to move again and the Civic will take it from there. 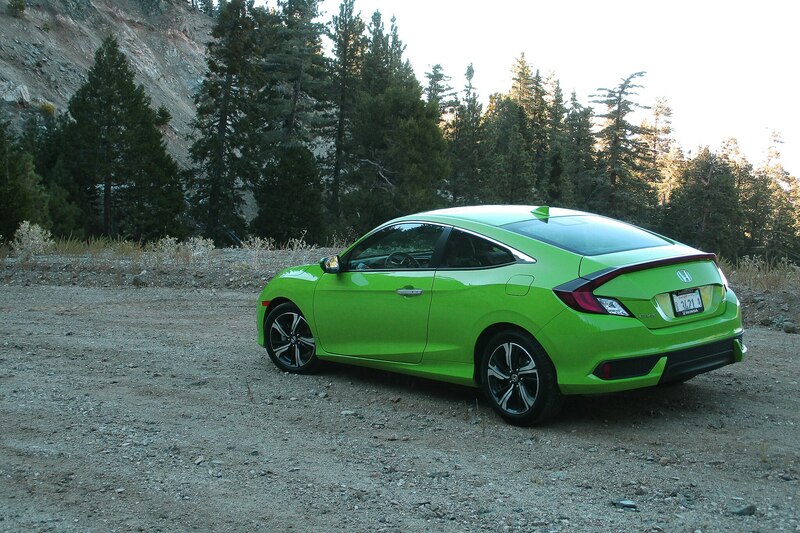 The Civic felt lively enough on the giant parking lot known as California’s 405, so we decided to burn an afternoon by heading for the hills. 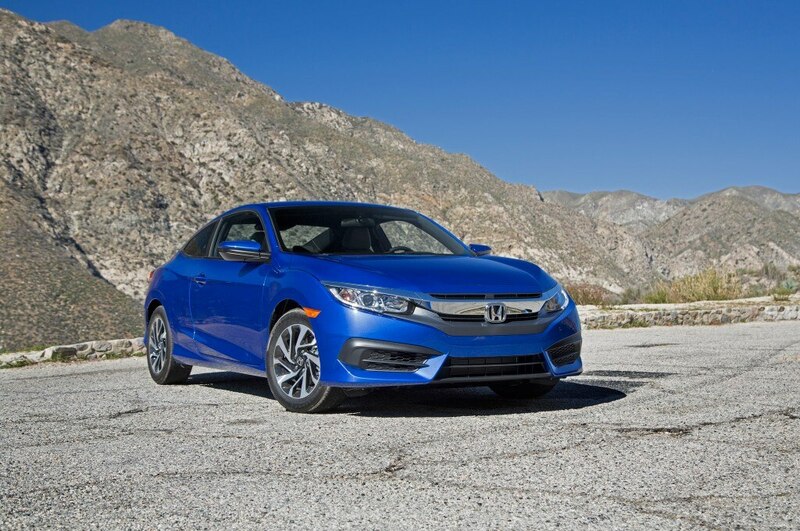 It proved less nimble around the tight bends of the famous Angeles Crest Highway than expected, but in an easily correctible manner. 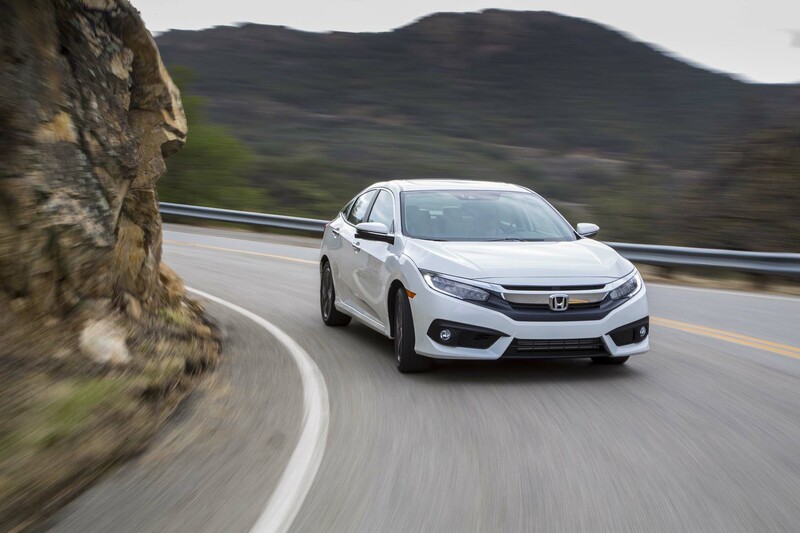 The stock 215/50 R17 Continental ProContact TX tires are quiet on the highway, but the low rolling-resistance compound’s treadwear rating of 500 provides about as much grip as a set of hockey pucks. 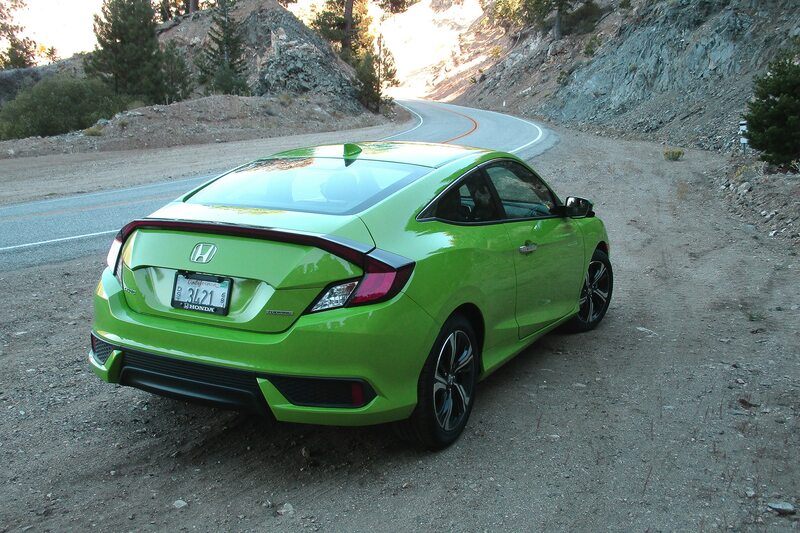 The tires inspired little confidence to seriously attack corners in the canyons, where the rear end attempted repeatedly to step out. 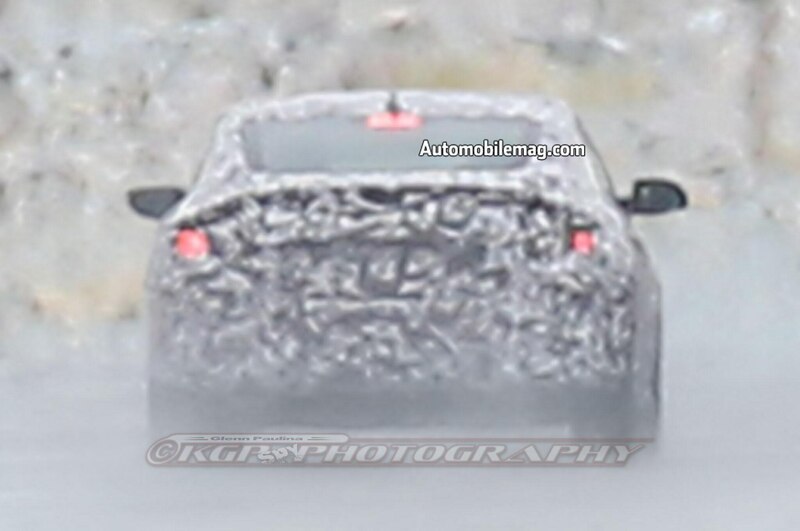 On the plus side, the tail-happy demeanor negated the limited understeer the chassis delivered. 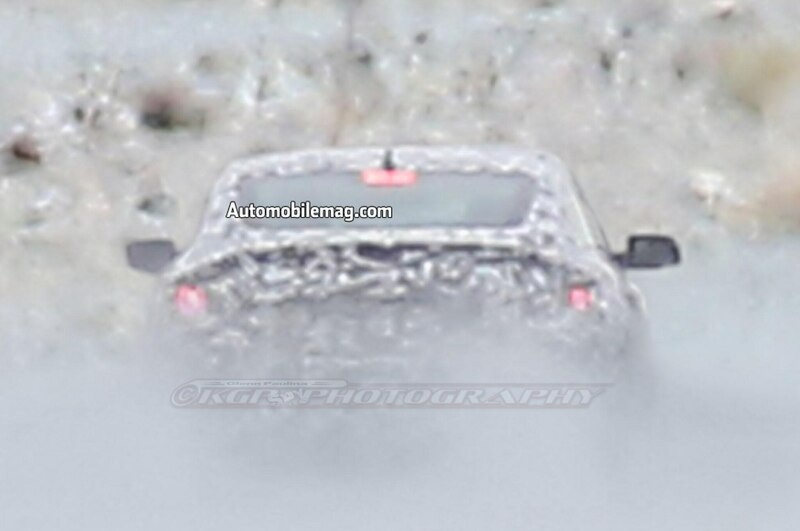 Regardless, enthusiast drivers will want to get a set of stickier tires as soon as possible. 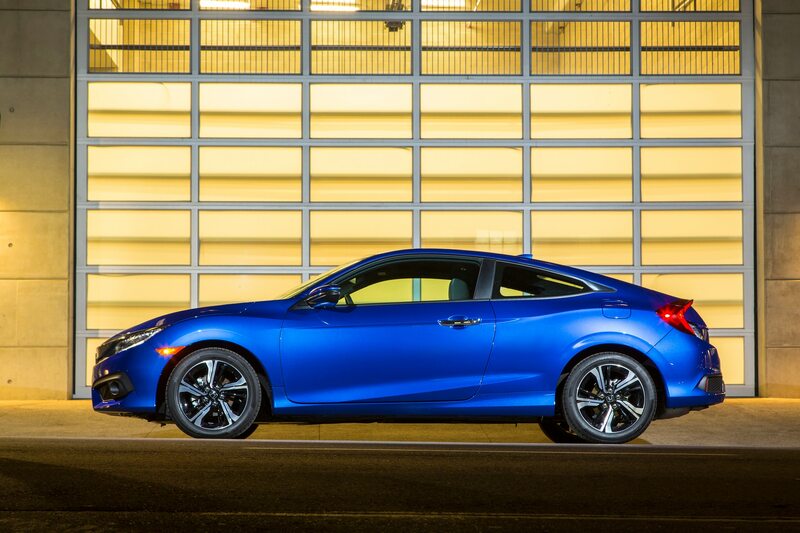 Responsive four-wheel disc brakes, ventilated up front and solid at rear, don’t deliver sports-car-like pedal feedback—but neither does the pedal feel like stepping on a sponge. 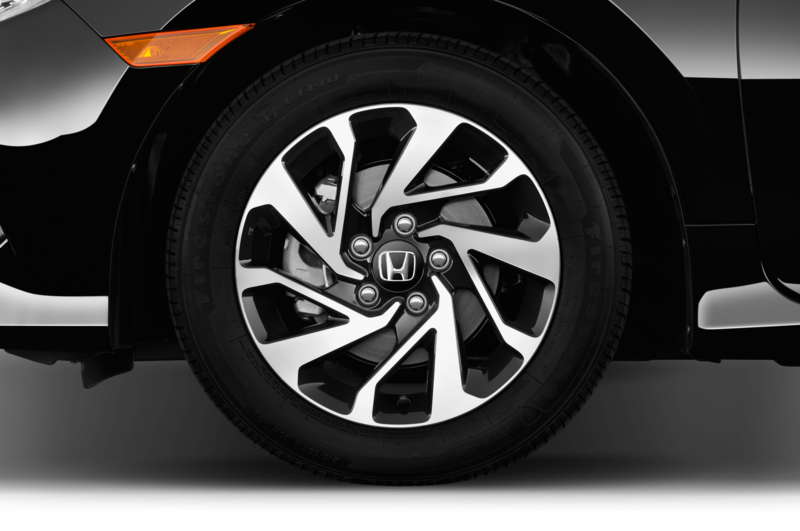 The four-wheel independent suspension is comprised of a MacPherson strut front and multi-link rear. 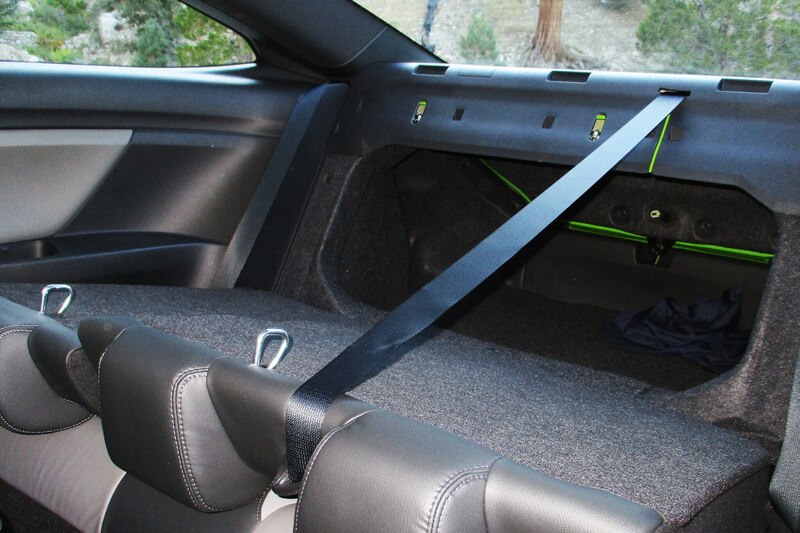 Comfortably smooth during the commute, it was balanced and compliant when pushed (at least as far as we could tell, given the limited grip we had to work with). 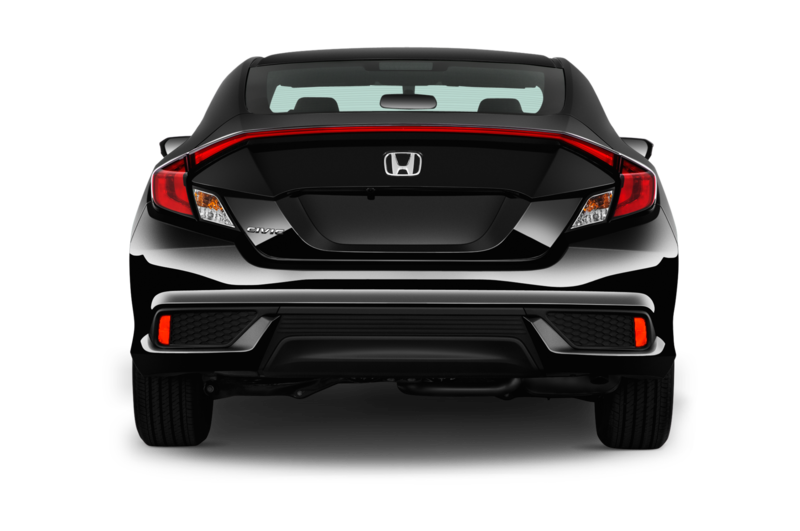 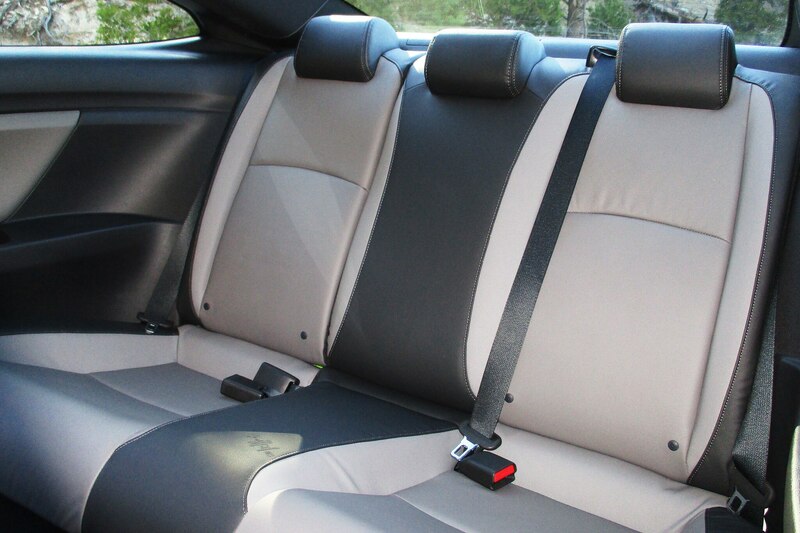 Weight transfers smoothly, but excessive body roll made us want a set of thicker anti-roll bars. 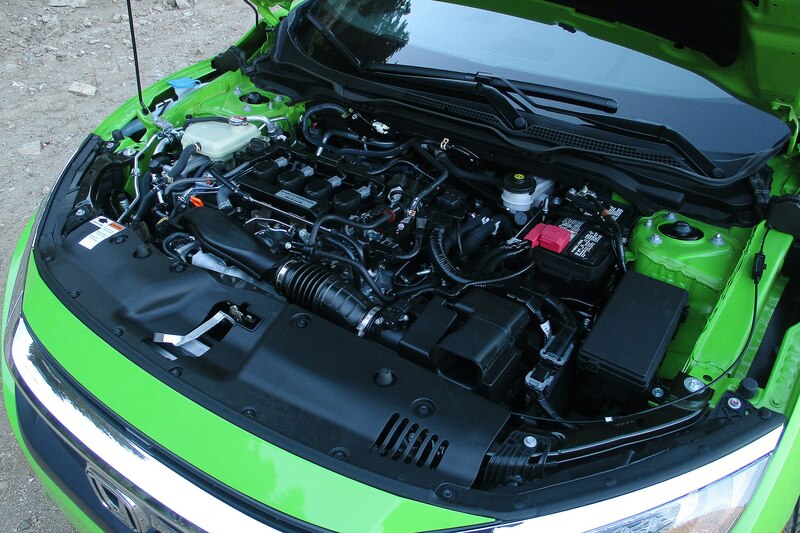 Last but not least is the transmission, which we glossed over intentionally. 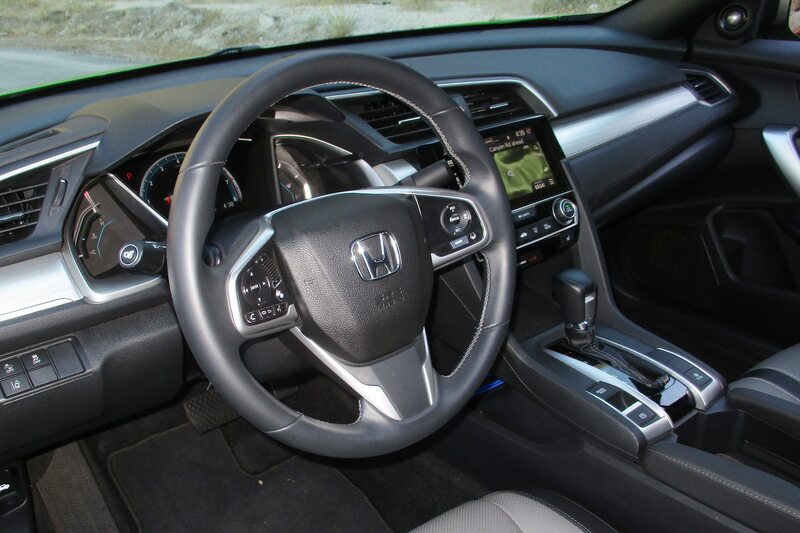 Though it isn’t much fun at a baseline level and there are no paddle shifters, there is a satisfactory work-around built in. 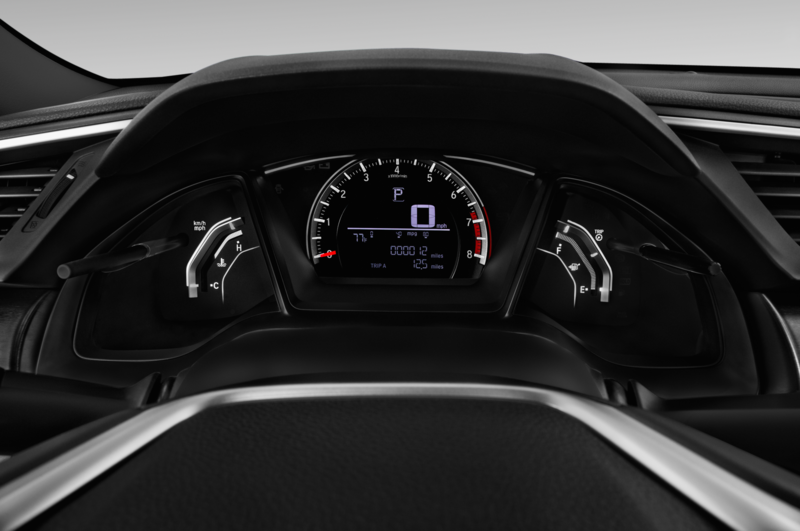 Sending the gear lever all the way down to “L” kept the engine droning close to its peak at around 4,000 rpm, and firmly within the peak torque band. 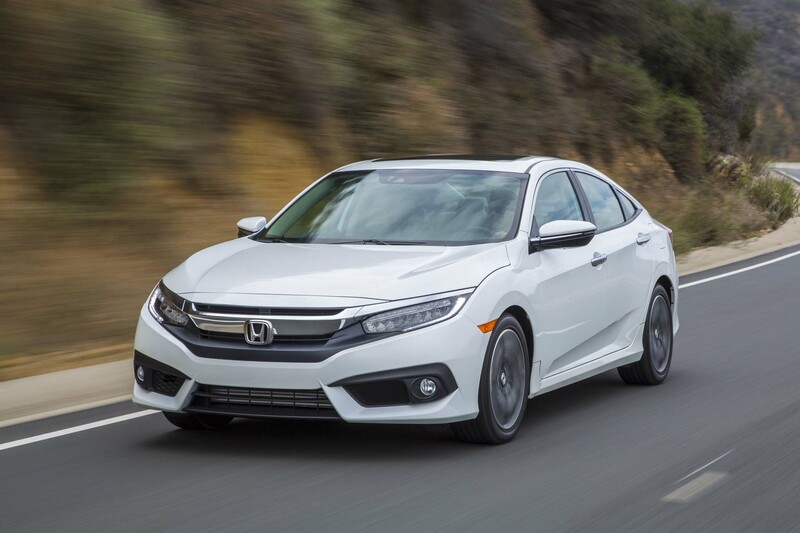 As a result, the Civic scrubs a bit of speed easily when entering a corner without hitting the brakes, while providing plenty of thrust on corner exit without you needing to worry about downshifting from fourth to third gear. 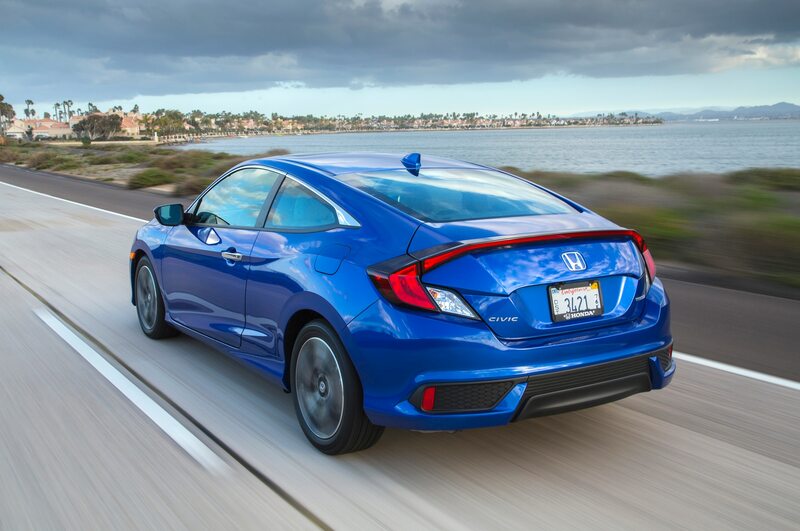 Ultimately, driving enthusiasts are better off saving $5,000 by opting for the manual-gearbox equipped Civic EX-T and spending the leftover cash on new tires and antiroll bars. 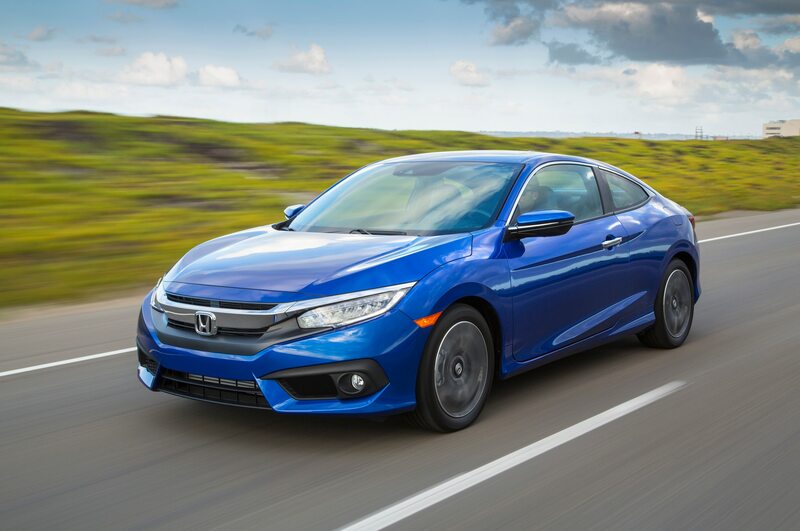 The engine and chassis are the car’s best parts, and the overall fun factor goes up dramatically with a do-it-yourself six-speed. 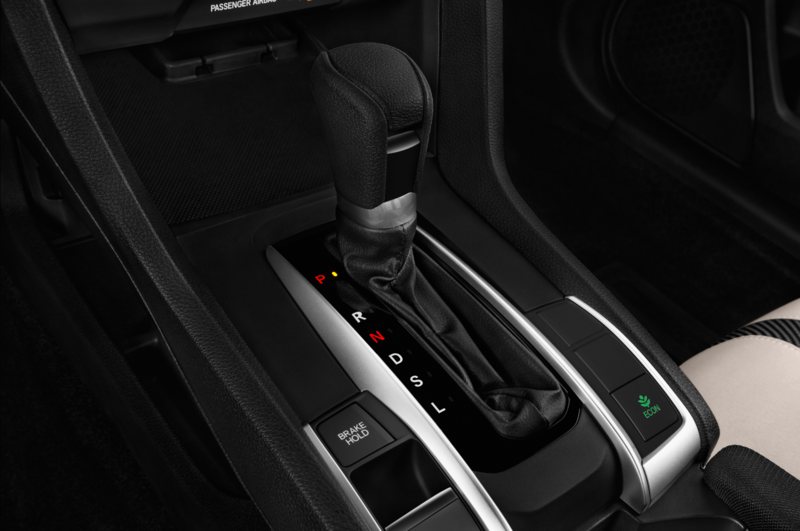 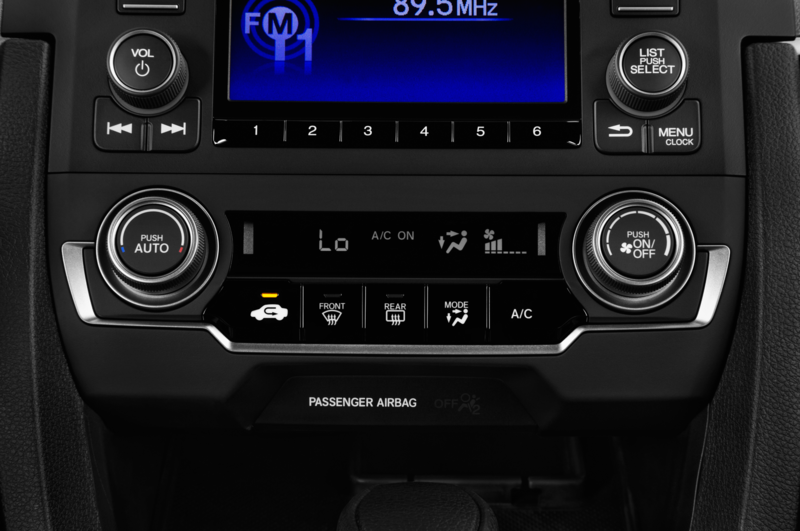 Though the leather, nav, and adaptive cruise control are nice luxuries, cloth seats don’t get as hot in the summer or as cold in the winter, Waze makes a better navigator than any in-car system, and while adaptive cruise control is here to stay, the same can’t be said for the endangered manual gearbox.